A polyethylene multi-layer porous membrane comprising at least two layers, which membrane comprises (a) a polyethylene resin porous layer (A) containing a high-density polyethylene (A) having at least 0.2 terminal vinyl group per 10,000 carbon atoms as determined by infrared spectroscopy and (b) a polyethylene resin porous layer (B) containing a high-density polyethylene (B) having less than 0.2 terminal vinyl group per 10,000 carbon atoms as determined by infrared spectroscopy. This membrane is excellent in the balance among permeability, mechanical strengths, resistance to heat shrinkage, shut-down characteristics, meltdown characteristics, and oxidation resistance. 本发明涉及聚乙烯多层多微孔膜及其制造方法、及电池用隔板，尤其涉及透过性、 机械强度、耐热收缩性、关闭（Shut down)特性、消融特性及耐氧化性的协调出色的聚乙烯多层多微孔膜及其制造方法、及电池用隔板。  The present invention relates to multilayer microporous polyethylene film and a manufacturing method, and battery separator, particularly to permeability, mechanical strength, heat shrinkage resistance, shutdown (Shut down) properties, characteristics and ablation resistance excellent oxidative coordination polyethylene multilayer microporous film and the manufacturing method, and a battery separator. 聚乙烯多微孔膜广泛使用于以锂电池用为首的电池用隔板、电解电容器用隔膜、 各种过滤器等用途。  The same polyethylene microporous membrane are widely used in a lithium battery led battery separator, a separator for electrolytic capacitors, various filters purposes. 在将聚乙烯多微孔膜作为电池用隔板使用的情况下，其性能与电池的特性、生产率及安全性紧密相关。 In the case of a polyethylene microporous membrane is used as a battery separator, which is closely related to the characteristics of the battery performance, productivity and safety. 因此，要求其具有出色的透过性、机械特性、耐热收缩性、 关闭特性、消融特性等。 Therefore, required to have excellent permeability, mechanical properties, heat shrinkage resistance, shutdown properties, ablation characteristics. 例如，若机械强度低，则在用作电池用隔板的情况下，电池的电压容易降低。 For example, when a low mechanical strength if, then used as a battery separator, the battery voltage tends to decrease. 作为改进聚乙烯多微孔膜的物性的方法，提出了将原料组成、拉伸条件、热处理条件等最佳化的技术。  As a method for improving the physical properties of the polyethylene microporous membrane, the proposed material composition, stretching conditions optimization techniques, heat treatment conditions and the like. 例如，1097/^235¾中，作为具有高的耐短路性（关闭特性）的聚乙烯多微孔膜，公开了由基于红外分光法的末端乙烯基浓度在每10，000个的碳原子中为2个以上的高密度聚乙烯或线状共聚合聚乙烯构成的多微孔膜。 For example, 1097 / ^ 235¾, as the polyethylene microporous membrane having high short circuit resistance (shutdown properties), and discloses a terminal vinyl group concentration based on infrared spectroscopy as per 10,000 carbon atoms a microporous membrane composed of two or more polyethylene high density polyethylene, linear or copolymerized. 但是，最近，不仅透过性、机械强度、耐热收缩性及热特性（关闭特性及消融特性），而且与周期特性等电池寿命有关的特性、或耐氧化性等与电池的保存特性有关的特性、或电解液注入性等与电池生产率有关的特性也受到了重视。  However, recently, not only permeability, mechanical strength, heat shrinkage resistance and thermal properties (shutdown properties and ablation characteristics), and characteristics associated with the cycle life characteristics of the battery, the oxidation resistance or the like of the storage battery features and productivity-related characteristics of the battery characteristics, or electrolyte injection property, also received attention. 为了得到出色的周期特性及电解液注入性，优选透过性及机械强度出色。 In order to obtain an excellent cycle characteristic and an electrolyte injection property, preferably excellent permeability and mechanical strength. 为了得到出色的安全性，优选关闭特性及耐热收缩性出色。 In order to obtain excellent safety, shutdown characteristics and is preferably excellent in resistance to heat shrinkage. 但是，现状是没有得到协调性良好地具有透过性、机械强度、耐热收缩性、关闭特性、消融特性及耐氧化性的电池用隔板用多微孔膜。 However, the current situation is not good coordination with permeability, mechanical strength, heat shrinkage resistance, shutdown properties, oxidation resistance and ablation characteristics of a battery separator with a microporous membrane. 本发明的目的在于提供透过性、机械强度、耐热收缩性、关闭特性、消融特性及耐氧化性的协调出色的聚乙烯多层多微孔膜及其制造方法、及电池用隔板。  The object of the present invention is to provide permeability, mechanical strength, heat shrinkage resistance, shutdown properties, ablation characteristics and excellent oxidation resistance coordination polyethylene multilayer microporous film and the manufacturing method, and a battery bulkhead. 鉴于上述目的，经专心致志的研究结果，本发明人等发现，如下所述的聚乙烯多层多微孔膜的透过性、机械强度、耐热收缩性、关闭特性、消融特性及耐氧化性的协调出色，从而想到了本发明，该聚乙烯多层多微孔膜具有：(a)聚乙烯系树脂多孔层A，其包含利用红外分光法测定的末端乙烯基浓度在规定值以上的高密度聚乙烯A ；及（b)聚乙烯系树脂多孔层B，其包含利用红外分光法测定的末端乙烯基浓度小于规定值的高密度聚乙烯B。  In view of the above-described object, the result of dedicated research, the present inventors have found that, as the permeability of the multilayer microporous polyethylene membrane, mechanical strength, heat shrinkage resistance, shutdown properties, and ablation characteristics coordination excellent oxidation resistance, and thus conceived the present invention, the multilayer microporous polyethylene membrane having: (a) a porous polyethylene resin layer a, which contains a predetermined value measured by infrared spectroscopy in the terminal vinyl group concentration a more high-density polyethylene; and (b) a porous polyethylene resin layer B, which comprises using measured by infrared spectroscopy terminal vinyl group concentration of less than the high density polyethylene predetermined value B.
 S卩，本发明的聚乙烯多层多微孔膜，其至少包括两层，其特征在于，具有：（a)聚乙烯系树脂多孔层A，其包含利用红外分光法测定的末端乙烯基浓度在每10，000个碳原子中为0.2个以上的高密度聚乙烯A ；及（b)聚乙烯系树脂多孔层B，其包含利用红外分光法测定的末端乙烯基浓度在每10，000个碳原子中小于0. 2个的高密度聚乙烯B。  S Jie, microporous polyethylene multilayer film of the present invention, which comprises at least two layers, characterized by comprising: (a) a porous polyethylene resin layer A, which comprises a terminal measured by infrared spectroscopy vinyl group concentration per 10,000 carbon atoms is 0.2 or more high-density polyethylene a; and (b) a porous polyethylene resin layer B, which was measured by infrared spectroscopy comprising terminal vinyl group concentration per 10 , 000 carbon atoms is less than 0.2 in high density polyethylene B. 所述高密度聚乙烯A的所述末端乙烯基浓度优选在每10，000个碳原子中为0. 4 个以上，更优选0. 6个以上。  The high-density polyethylene A is preferably in the terminal vinyl group concentration per 10,000 carbon atoms is 0.4 or more, and more preferably 0. 6 or more. 优选所述高密度聚乙烯B的所述末端乙烯基浓度在每10，000个碳原子中小于0. 15个。 The high-density polyethylene B is preferably the terminal vinyl group concentration of less than 0.15 per 10,000 carbon atoms. 所述高密度聚乙烯A及B的重均分子量（Mw)是5X105以下，且相对于数均分子量（Mn)的Mw之比优选5〜300。 The high-density polyethylene A and B weight average molecular weight (Mw) is less 5X105, and the number average molecular weight (Mn) of the Mw is preferably 5~300. 优选所述聚乙烯系树脂多孔层A包含：含有所述高密度聚乙烯A及重均分子量为7X IO5以上的超高分子量聚乙烯的聚乙烯组合物A。  Preferably, the porous polyethylene resin layer A comprises: A comprising high-density polyethylene and the weight average molecular weight of not less than 7X IO5 polyethylene ultrahigh molecular weight polyethylene composition A. 所述聚乙烯组合物A中的所述高密度聚乙烯A及所述超高分子量聚乙烯的配合比例优选按质量％为：所述高密度聚乙烯A/所述超高分子量聚乙烯为50/50〜99/1。 The mixing ratio of the polyethylene composition A is A and the high density polyethylene ultrahigh molecular weight polyethylene is preferably in mass%: said high-density polyethylene A / 50 of the ultrahigh molecular weight polyethylene / 50~99 / 1. 优选所述聚乙烯系树脂多孔层B包含：含有所述高密度聚乙烯B及重均分子量为7X IO5以上的超高分子量聚乙烯的聚乙烯组合物B。  Preferably, the porous polyethylene resin layer B comprises: B comprising high-density polyethylene and the weight average molecular weight of not less than 7X IO5 polyethylene ultrahigh molecular weight polyethylene composition B. 所述聚乙烯组合物B中的所述高密度聚乙烯B及所述超高分子量聚乙烯的配合比例优选按质量％为：所述高密度聚乙烯B/所述超高分子量聚乙烯为50/50〜99/1。 The polyethylene composition B, the mixing ratio of high-density polyethylene B and the ultrahigh molecular weight polyethylene is preferably in mass%: said high-density polyethylene B / 50 of the ultrahigh molecular weight polyethylene / 50~99 / 1. [0011 ] 优选所述聚乙烯组合物A及B的重均分子量为1 X IO4〜5 X 106，且Mw/Mn为5〜 300。  Preferably the polyethylene composition A and B weight average molecular weight of 1 X IO4~5 X 106, and Mw / Mn of -5 to 300. 本发明的第一聚乙烯多层多微孔膜的制造方法，其特征在于，熔融混炼包含利用红外分光法测定的末端乙烯基浓度在每10，000个碳原子中为0. 2个以上的高密度聚乙烯A的聚乙烯系树脂A、及成膜用溶剂，配制聚乙烯系树脂溶液A，并且熔融混炼包含利用红外分光法测定的末端乙烯基浓度在每10，000个碳原子中小于0. 2个的高密度聚乙烯B的聚乙烯系树脂B、及成膜用溶剂，配制聚乙烯系树脂溶液B，从模头同时挤出所述聚乙烯系树脂溶液A及B，冷却得到的挤出成形体，形成凝胶状层叠片，从所述凝胶状层叠片除去所述成膜用溶剂。  The first method for producing a multilayer microporous polyethylene film of the present invention, wherein the melt-kneading measured by infrared spectroscopy comprising terminal vinyl group concentration per 10,000 carbon atoms is 0. a polyethylene-based resin having two or more of high-density polyethylene a and the film-forming solvent to prepare a polyethylene resin solution a, and the melt kneading comprises using infrared spectroscopy measurement terminal vinyl group concentration per 10,000 carbon atoms is less than 0.2 B HDPE polyethylene resin B, and the film-forming solvent to prepare a polyethylene resin solution B, while extruding the polyethylene-based resin from the die a solution of and B, cooling the resulting extruded article to form a gel-like laminate sheet, removing the solvent from the film-forming gel-like laminate sheet. 本发明的第二聚乙烯多层多微孔膜的制造方法，其特征在于，熔融混炼包含利用红外分光法测定的末端乙烯基浓度在每10，000个碳原子中为0. 2个以上的高密度聚乙烯A的聚乙烯系树脂A、及成膜用溶剂，配制聚乙烯系树脂溶液A，并且熔融混炼包含利用红外分光法测定的末端乙烯基浓度在每10，000个碳原子中小于0. 2个的高密度聚乙烯B的聚乙烯系树脂B、及成膜用溶剂，配制聚乙烯系树脂溶液B，从模头个别地挤出所述聚乙烯系树脂溶液A及B，冷却得到的挤出成形体A及B，形成凝胶状片A及B，从所述凝胶状片A及B除去所述成膜用溶剂，形成聚乙烯多微孔膜A及B，层叠所述聚乙烯多微孔膜A及B。  The second method for producing a multilayer microporous polyethylene film of the present invention, wherein the melt-kneading measured by infrared spectroscopy comprising terminal vinyl group concentration per 10,000 carbon atoms is 0. a polyethylene-based resin having two or more of high-density polyethylene a and the film-forming solvent to prepare a polyethylene resin solution a, and the melt kneading comprises using infrared spectroscopy measurement terminal vinyl group concentration per 10,000 carbon atoms is less than 0.2 B HDPE polyethylene resin B, and the film-forming solvent to prepare a polyethylene resin solution B, separately extruding the polyethylene resin solutions from the die a and B, cooling the resulting extruded article a and B, form a gel-like sheets a and B, the solvent is removed from the film-forming gel-like sheet a and B, forming a polyethylene microporous membrane a and B, the laminated film A microporous polyethylene and B. 在第一及第二方法中，优选所述聚乙烯系树脂溶液A及B的树脂浓度存在差异，由此得到具有平均细孔径在膜厚方向上变化的结构（倾斜结构）的聚乙烯多层多微孔膜。  In the first and second method, there is preferred that the resin concentration difference between the polyethylene resin solutions A and B, thereby obtaining a polyethylene having an average pore diameter changing in a thickness direction of the structure (inclined structure) ethylene multilayer microporous film. 所述聚乙烯系树脂溶液A及B的树脂浓度之差优选5质量％以上，更优选10质量％以上。 The difference between the polyethylene resin is preferably 5 mass concentration of the resin solution A and B%, more preferably 10% by mass or more. 本发明的电池用隔板利用上述聚乙烯多层多微孔膜形成。 Forming the battery  The present invention utilizes the polyethylene multilayer microporous membrane separator. 形成本发明的聚乙烯多层多微孔膜（以下，有时简称为“多层多微孔膜”或“多微孔膜”）的聚乙烯系树脂多孔层A(以下，没有特别限定的情况下称为“多孔层A”）的聚乙烯系树脂A为（a)利用红外分光法测定的末端乙烯基浓度在每10，000个碳原子中为0.2 个以上的高密度聚乙烯A ;(b)高密度聚乙烯A和其以外的聚乙烯的混合物（聚乙烯组合物A) ； (c)这些（a)或（b)、和聚乙烯、聚丙烯及聚甲基戊烯以外的聚烯烃的混合物（聚烯烃组合物A)；或(d)这些（a)〜（c)的任一种、和熔点或玻璃化转变温度（Tg)为150°C以上的耐热性树脂（耐热性聚乙烯系树脂A)。  The multilayer microporous film of polyethylene formed according to the present invention (hereinafter, sometimes abbreviated as "multi-layer microporous membrane" or "microporous film") of the porous polyethylene resin layer A (hereinafter, is not particularly a polyethylene-based resin referred to in the case defined "porous layer a") was determined to be (a) by infrared spectroscopy in the terminal vinyl group concentration per 10,000 carbon atoms is 0.2 or more high-density polyethylene a; mixture (b) a high density polyethylene and polyethylene other than this (polyethylene composition a); (C) which (a) or (b), and polyethylene, polypropylene, and polymethylpentene the mixture (the polyolefin composition a) other than the polyolefin; or (d) which (a) ~ (c) any one, and a melting point or glass transition temperature (Tg) of 150 ° C or higher heat resistance resin (heat-resistant polyethylene resin A). 高密度聚乙烯A的利用红外分光法测定的末端乙烯基浓度在每10，000个碳原子中为0.2个以上。 Measured  by infrared spectroscopy, high-density polyethylene A is in the terminal vinyl group concentration per 10,000 carbon atoms is 0.2 or more. 若该末端乙烯基浓度小于0.2个，则多微孔膜的关闭特性不充分。 If the terminal vinyl group concentration is less than 0.2, the shutdown characteristics are not sufficiently microporous membrane. 该末端乙烯基浓度优选0. 4个以上，更优选0. 6个以上。 The terminal vinyl group concentration is preferably 0. 4 or more, and more preferably 0. 6 or more. 末端乙烯基浓度是高密度聚乙烯A中的每10，000个碳原子中的末端乙烯基浓度的个数（以下，单位表示为“个/10，000C”），利用红外分光法求出。  The terminal vinyl group concentration per 10,000 carbon atoms in the end of high-density polyethylene A is the number of vinyl group concentration (hereinafter, expressed in units of "a / 10,000C"), by infrared spectroscopy obtained. 具体来说，将高密度聚乙烯A的颗粒加热加压，将其成形为约Imm厚度的样品后，利用傅立叶变换红外分光光度计（型号：FREEXACT-II、株式会社堀场制作所制）测定QlOcnT1下的吸收峰的吸光度[A = Iog(IcZI)(其中，A表示吸光度，Itl表示空白单元的透过光强度，I表示样品单元的透过光强度）]，利用下述式：末端乙烯基浓度（个/10，000C) = (1. 14X吸光度）/[聚乙烯的密度（g/cm3) X样品的厚度（mm)]算出。 Specifically, after the particles of high-density polyethylene A heat and pressure, and molded sample of a thickness of about Imm, Fourier transform infrared spectrophotometer (Model: FREEXACT-II, manufactured by Horiba, Ltd.) was measured peak absorbance at QlOcnT1 [a = Iog (IcZI) (wherein, a represents an absorbance, represents the intensity of transmitted light Itl, I represents the intensity of light transmitted through the sample unit cell blank)], by the following formula: terminal vinyl group concentration (number / 10,000C) = (1. 14X absorbance) / [density of the polyethylene (g / cm3) X sample thickness (mm)] was calculated. 高密度聚乙烯A优选均聚物，但也可以为含有少量其他的α-烯烃的共聚物。  A is preferably a high density polyethylene homopolymer, but may be a small amount of other α- olefin copolymer containing. 作为其他的α烯烃，可以举出丙烯、丁烯-1、戊烯-1、己烯-1、4_甲基戊烯-1、辛烯、乙酸乙烯酯、甲基丙烯酸甲酯、苯乙烯等。 Examples of other α-olefins include propylene, butene-1, pentene-1, hexene -1,4_ methylpentene-1, octene, vinyl acetate, methyl methacrylate, styrene Wait. 如上所述的高密度聚乙烯A例如可以利用特公平1-12777号中记载的方法来制造。  A high density polyethylene as described above, for example by the method described in Kokoku No. 1-12777 is manufactured. 若利用特公平1-12777号中记载的方法，则能够使用将有机金属化合物组合的铬化合物载体催化剂，利用悬浮聚合、溶液聚合或气相聚合来制造乙烯。 If the method described in Kokoku No. 1-12777 is utilized, the chromium compound can be a supported catalyst using organometallic compound in combination, by suspension polymerization, solution polymerization or gas phase polymerization of ethylene produced. 聚乙烯组合物A是高密度聚乙烯A和其以外的聚乙烯的混合物。  A polyethylene composition A is a mixture of high density polyethylene and polyethylene other than this. 高密度聚乙烯A 与上述相同也可。 A high-density polyethylene may be same as described above. 作为高密度聚乙烯A以外的聚乙烯，优选超高分子量聚乙烯、中密度聚乙烯、支化状低密度聚乙烯、及链状低密度聚乙烯。 As the polyethylene other than high-density polyethylene A, preferably ultrahigh molecular weight polyethylene, medium-density polyethylene, branched low-density polyethylene, and linear low density polyethylene. 作为聚乙烯组合物A，优选包括高密度聚乙烯A和超高分子量聚乙烯的组合物。 As the polyethylene composition A, A preferably comprises high density polyethylene and ultrahigh molecular weight polyethylene composition. 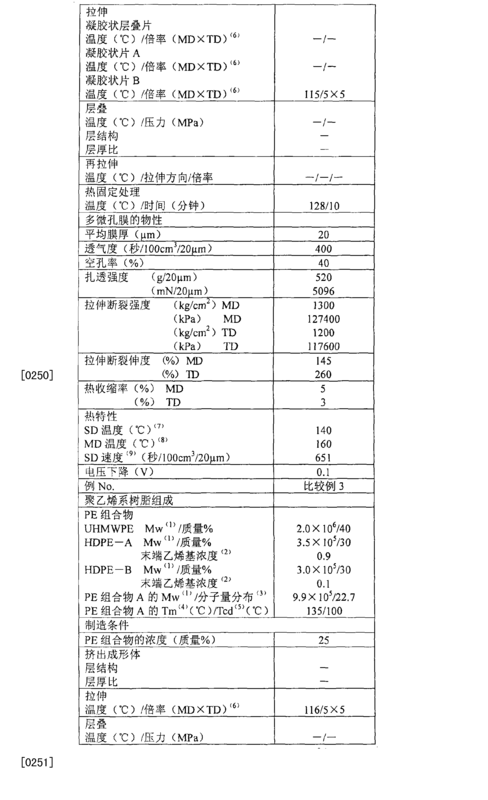 超高分子量聚乙烯具有7X IO5以上的Mw。  The ultrahigh molecular weight polyethylene having more than 7X IO5 Mw. 超高分子量聚乙烯不仅可以为乙烯的自聚体，而且可以为含有少量其他α-烯烃的乙烯· α-烯烃共聚物。 Ultrahigh molecular weight polyethylene can be not only self-mer ethylene, but also ethylene · α- olefin copolymer containing a small amount of other alpha] -olefin. 作为乙烯以外的α-烯烃，优选丙烯、丁烯-I、戊烯-I、己烯-1，4-甲基戊烯-1、辛烯、乙酸乙烯酯、甲基丙烯酸甲酯、及苯乙烯。 As α- olefin other than ethylene, propylene, butene -I, pentene -I, hexene, 4-methylpentene-1, octene, vinyl acetate, methyl methacrylate, and benzene ethylene. 超高分子量聚乙烯的Mw优选IX IO6〜15Χ106，更优选IX IO6〜5Χ106。 Preferably UHMWPE Mw IX IO6~15Χ106, more preferably IX IO6~5Χ106. 中密度聚乙烯、支化状低密度聚乙烯、及链状低密度聚乙烯具有IXlO4〜5X IO5 的Mw。  The medium-density polyethylene, branched low-density polyethylene, and linear low density polyethylene having a Mw IXlO4~5X IO5. Mw为IX IO4〜5X IO5的聚乙烯不仅可以为乙烯的自聚体，而且可以为含有少量丙烯、丁烯-1、己烯-1等其他α-烯烃的共聚物。 IX IO4~5X IO5 Mw of polyethylene may be not only self-ethylene mer, but also other α- olefin copolymer small amounts of propylene, butene-1, hexene-1, etc. to contain. 作为这样的共聚物，优选利用单活性中心(single site)催化剂制造。 As such a copolymer, preferably using a single site (single site) catalyst manufacture. 聚乙烯组合物A的Mw优选1 X IO4〜5 X IO6,更优选1 X IO5〜4X 106，进而优选1 X IO5〜1 X 106。  A polyethylene composition has Mw of preferably 1 X IO4~5 X IO6, more preferably 1 X IO5~4X 106, more preferably 1 X IO5~1 X 106. 若将聚乙烯组合物A的Mw设为1 X IO6以下，则能够进一步增大多孔层A 的平均细孔径。 If Mw of the polyethylene composition A is set to 1 X IO6 or less, it is possible to further increase the average pore diameter of the porous layer A. 聚乙烯组合物A中的高密度聚乙烯A以外的聚乙烯的比例在将聚乙烯组合物A全部设为100质量％的情况下优选为1质量％以上，更优选2〜50质量％。  A polyethylene composition ratio of polyethylene other than high-density polyethylene A is in the case where all of the polyethylene composition A is 100% by mass is preferably 1 mass%, more preferably 2~50 mass %. 聚烯烃树脂A是高密度聚乙烯A或聚乙烯组合物A、和聚乙烯、聚丙烯及聚甲基戊烯以外的聚烯烃的混合物。  A polyolefin resin is a mixture of high density polyethylene or a polyolefin other than A polyethylene composition A, and polyethylene, polypropylene, and polymethylpentene. 高密度聚乙烯A及聚乙烯组合物A与上述相同。 A high density polyethylene and the polyethylene composition A as defined above. 作为聚乙烯、聚丙烯及聚甲基戊烯以外的聚烯烃，可以使用选自由各自的Mw为1 X IO4〜4X IO6的聚丁烯-1、聚戊烯-1、聚己烯-1、聚辛烯-1、聚乙酸乙烯酯、聚甲基丙烯酸甲酯、聚苯乙烯及乙烯· α -烯烃共聚物、及Mw为1 X IO3〜1 X IO4的聚乙烯蜡构成的组中的至少一种。  As the polyolefin other than polyethylene, polypropylene and polymethyl pentene may be selected from the group consisting of a respective Mw of 1 X IO4~4X IO6 polybutene-1, polypentene-1, polyhexene -1, polyoctene-1, polyvinyl acetate, polymethyl methacrylate, polystyrene and an ethylene · α - olefin copolymer, polyethylene wax and Mw of group 1 X IO3~1 X IO4 composed of at least one. 聚丁烯-1、聚戊烯-1、聚己烯-1、聚辛烯-1、聚乙酸乙烯酯、聚甲基丙烯酸甲酯、及聚苯乙烯不仅可以为自聚体，而且可以为含有其他α-烯烃的共聚物。 Polybutene-1, poly-1, poly-hexene-1, octene-1, polyethylene, polyvinyl acetate, polymethyl methacrylate and polystyrene can be not only self-mer, and can be α- olefin copolymer containing other. 聚乙烯、聚丙烯及聚甲基戊烯以外的聚烯烃的比例在将聚烯烃组合物A全部作为100质量％的情况下， 优选20质量％以下，更优选10质量％以下。 Proportion of the polyolefin other than polyethylene, polypropylene and polymethyl pentene in the case where all of the polyolefin composition A as 100 mass%, preferably 20% by mass or less, more preferably 10 mass% or less. 耐热性聚乙烯系树脂组合物A是上述（a)〜（C)的任一种、和熔点或玻璃化转变温度（Tg)为150°C以上的耐热性树脂的混合物。  The heat-resistant polyethylene resin composition A is above (a) ~ (C) of any one, and a melting point or glass transition temperature (Tg) of 150 ° C or more a mixture of heat-resistant resin. 作为耐热性树脂，优选熔点为150°C以上的结晶性树脂（包括部分为结晶性的树脂）、及Tg为150°C以上的非晶性树脂。 As the heat-resistant resin, preferably having a melting point above 150 ° C the crystalline resin (including partially crystalline resin), and Tg of 150 ° C or more amorphous resin. 在此，熔点及Tg可以利用JIS K7121测定（以下相同）。 Here, the melting point and Tg can be measured (the same applies hereinafter) using the JIS K7121. 若聚乙烯系树脂A含有耐热性树脂，则在将多层多微孔膜用作电池用隔板的情况下提高消融温度，因此，提高电池的高温保存特性。  When the polyethylene resin A containing a heat-resistant resin, the temperature increase at the ablation multilayer microporous film is used as the separator for the battery case, therefore, improved high-temperature storage characteristics of a battery. 另外，耐热性树脂在熔融混炼时作为球状或旋转椭圆体状微粒，分散于上述（a)〜（c)的自聚体或组合物中。 Further, the heat resistance of the resin during the melt as a spherical or spheroid shaped particles, self-dispersing polymer or composition in the above-described (a) ~ (c) of. 还有，在拉伸时，以由耐热性树脂构成的微粒为核，由聚乙烯相（高密度聚乙烯A相或聚乙烯组合物A相及高密度聚乙烯B相或聚乙烯组合物B相）构成的原纤维开裂，形成在中心部保持了微粒的裂纹状细孔。 Further, when stretched to microparticles made of a heat-resistant resin as nuclei, the phase of polyethylene (high density polyethylene or polyethylene composition A-phase A-phase and B-phase high-density polyethylene or polyethylene composition phase B) composed of fibrils cracking, is formed at the center portion maintaining a fine crack-like pores. 因此，提高将多层多微孔膜用作电池用隔板的情况下的耐压缩性及电解液吸收性。 Therefore, to improve the compression resistance and electrolytic solution absorptivity in the case of a multilayer microporous film is used as a battery separator. 球状微粒的粒径及旋转椭圆体状微粒的长径优选0. 1〜15 μ m，更优选0. 5〜10 μ m， 尤其优选1〜10 μ m。 0. spherical particles preferably the major axis of the spheroid size and shape of the fine particles 1~15 μ m, and more preferably 0. 5~10 μ m, particularly preferably 1~10 μ m.
 耐热性树脂的熔点或Tg的上限不特别限定，但从与上述（a)〜（c)的自聚体或组合物的混炼容易性的观点出发，优选350°C。  The upper limit of the melting point or Tg of the heat-resistant resin is not particularly limited, but from the viewpoint of easy kneading the above (a) ~ (c) is polyethylene or from a starting composition, preferably 350 ° C. 耐热性树脂的熔点或Tg更优选170〜260°C。 Melting point or Tg of the heat-resistant resin is more preferably 170~260 ° C.
 耐热性树脂的优选的Mw根据树脂的种类的不同而不同，但通常为IXlO3以上〜 1 X IO6以下，更优选1 X IO4以上〜7 X IO5以下。  The preferred Mw of the heat-resistant resin depending on the type of the resin varies, but is usually above ~ 1 X IO6 IXlO3 or less, more preferably 1 X IO4 less than ~7 X IO5. 若使用大于7 X IO5的耐热性树脂，则与上述（a)〜（c)的自聚体或组合物的混炼变得困难。 The use of heat-resistant resin is greater than 7 X IO5, the above (a) ~ (c) self-mer or kneaded composition becomes difficult. 作为耐热性树脂的具体例，可以举出聚酯、聚丙烯（PP)、聚甲基戊烯[PMP或TPX(反式多伦托（卜，> 7 A > >卜）聚合物X)]、氟树脂、聚酰胺（PA、熔点：215〜265°C )、聚亚芳基硫醚（PAS)、聚苯乙烯（PS、熔点：230°C )、聚乙烯醇（PVA、熔点：220〜 2400C )、聚酰亚胺（PI、Tg ：2800C以上）、聚酰胺酰亚胺（PAI、Tg ：280°C )、聚醚砜（PES、 Tg ：223°C )、聚醚醚酮（PEEK、熔点：334°C )、聚碳酸酯（PC、熔点:220〜240°C )、乙酸纤维素（熔点：220°C )、三乙酸纤维素（熔点：300°C )、聚砜（Tg:190°C )、聚醚酰亚胺（熔点： 216°C )等。  Specific examples of the heat-resistant resin include polyesters, polypropylene (PP), polymethylpentene [the PMP or TPX (trans Duo Luntuo (Bu,> 7 A>> Bu) polymerization X-product)], fluororesins, polyamides (PA, melting point: 215~265 ° C), polyarylene sulfide (the PAS), polystyrene (the PS, melting point: 230 ° C), polyvinyl alcohol (PVA mp: 220~ 2400C), polyimides (PI, Tg: 2800C or more), polyamideimide (PAI, Tg: 280 ° C), polyether sulfone (PES, Tg: 223 ° C), poly ether ether ketone (PEEK, melting point: 334 ° C), polycarbonate (PC, melting point: 220~240 ° C), cellulose acetate (melting point: 220 ° C), cellulose triacetate (melting point: 300 ° C) , polysulfone (Tg: 190 ° C), polyetherimide (melting point: 216 ° C) and the like. 耐热性树脂不限定于由单一树脂成分构成，可以由多种树脂成分构成。 Is not limited to the heat-resistant resin composed of a single resin component, it may be made of different resin components. 作为聚酯，可以举出聚对苯二甲酸丁二醇酯（PBT、熔点：约160〜230°C )、聚对苯二甲酸乙二醇酯（PET、熔点：约250〜270°C)、聚萘二甲酸乙二醇酯（PEN、熔点：272°C)、 聚萘二甲酸丁二醇酯（PBN、熔点：245°C )等，但优选PBT。  Examples of the polyester include polyethylene terephthalate, polybutylene terephthalate (PBT, melting point: about 160~230 ° C), polyethylene terephthalate (PET, melting point: about 250~270 ° C), polyethylene terephthalate polyethylene naphthalate (PEN, melting point: 272 ° C), polyethylene naphthalate, polybutylene terephthalate (the PBN, melting point: 245 ° C) and the like, but is preferably PBT. PBT是基本上由1，4-丁二醇和对苯二甲酸构成的饱和聚酯。  PBT is essentially a saturated polyester from 1,4-butanediol and terephthalic configuration. 但是，在不牺牲耐热性、耐压缩性、耐热收缩性等物性的范围内，也可以含有1，4_ 丁二醇以外的二醇成分、或对苯二甲酸以外的羧酸成分作为共聚合成分。 However, without sacrificing the heat resistance, the range of physical properties of compression resistance, heat shrinkage resistance, etc., may contain the diol component other than butylene glycol 1,4_, or the carboxylic acid component other than terephthalic acid as co polymeric composition. 作为这样的二醇成分，例如，可以举出乙二醇、 二乙二醇、新戊二醇、1，4_环己烷甲醇等。 Examples of the diol component, for example, include ethylene glycol, diethylene glycol, neopentyl glycol, cyclohexane 1,4_ methanol. 另外，作为二羧酸成分，例如，可以举出间苯二甲酸、癸二酸、己二酸、壬二酸、琥珀酸等。 Further, as the dicarboxylic acid component, e.g., isophthalic acid include, sebacic acid, adipic acid, azelaic acid, succinic acid and the like. 作为构成PBT的PBT树脂的具体例，例如，可以举出TORAY株式会社作为商品名“特来肯（卜> 二>)”市售的均PBT树脂。 Specific examples of the PBT PBT resin constituting, for example, may include TORAY Co., Ltd. as trade name "Ken Laid to (BU> two>)" are commercially available PBT resin. 但是，PBT不限于单一组合物构成的树脂，也可以为由多个PBT树脂成分构成的树脂。 However, not limited to PBT resin made of a single composition, the resin component constituting the plurality of PBT resin may be by. PBT的Mw尤其优选2X IO4以上〜3X105以下。 In particular, more preferably the Mw PBT 2X IO4 ~3X105 less. 聚丙烯不仅可以为自聚体，也可以为含有其他的α-烯烃或二烯烃的嵌段共聚物或无规共聚物。  The polypropylene may be not only self-mer, or may be a block copolymer containing other olefins or diolefins α- or random copolymer. 作为其他的烯烃，优选乙烯或碳原子数4〜8的α-烯烃。 As another olefin, α- olefin having 4 to 8 carbon atoms, or preferably ethylene. 作为碳原子数4〜8的α-烯烃，例如，可以举出1-丁烯、1-己烯、4-甲基-1-戊烯等。 Examples 4 to 8 carbon atoms α- olefins, for example, include 1-butene, 1-hexene, 4-methyl-1-pentene. 二烯烃的碳原子数优选4〜14。 Preferred dienes number 4~14 carbon atoms. 作为碳原子数4〜14的二烯烃，例如，可以举出丁二烯、1，5_己二烯、1， 7-辛二烯、1，9_癸二烯等。 As 4~14 carbon atoms and diolefins, for example, include butadiene, 1,5_-hexadiene, 1,7-octadiene, decadiene 1,9_ like. 其他烯烃或二烯烃的含量在将丙烯共聚物作为100摩尔％的情况下优选小于10摩尔％。 Content of the other olefin or diolefin in the case of a propylene copolymer as 100 mol% preferably less than 10 mol%. 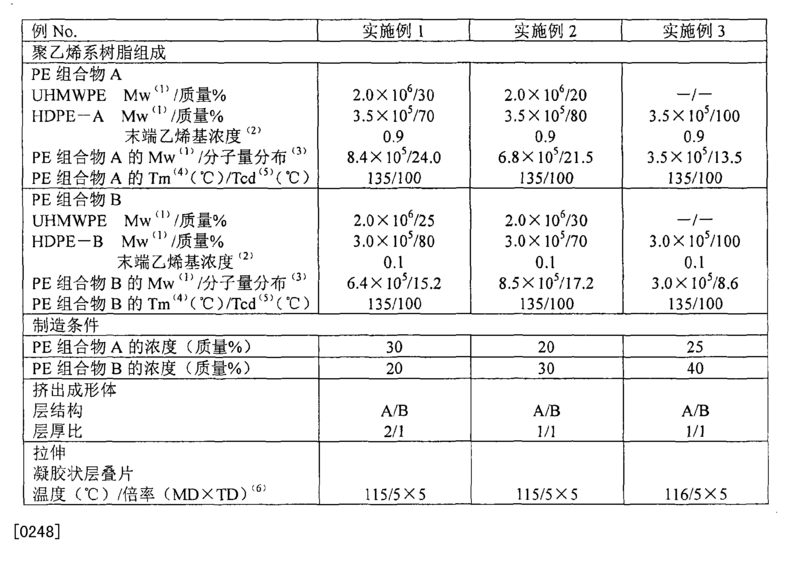 聚丙烯的Mw尤其优选1 X IO5以上〜8X IO5以下。  Mw of the polypropylene in particular, more preferably 1 X IO5 ~8X IO5 or less. 聚丙烯的分子量分布（Mw/Mn) 优选1.01〜100，更优选1. 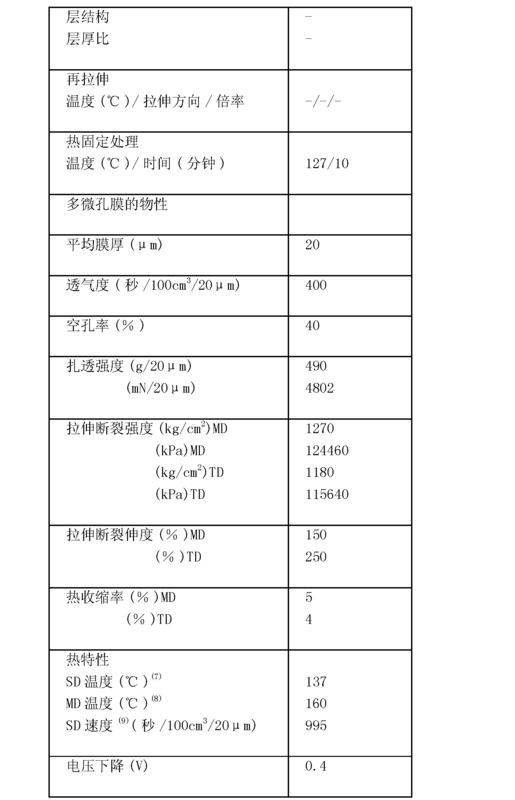 1〜50。 The molecular weight distribution of polypropylene (Mw / Mn) is preferably 1.01~100, more preferably 1. 1~50. 就必须可以为自聚体，也可以为含有两种以上聚丙烯的组合物。 Must be self-mer, the composition may be two or more polypropylene containing. 聚丙烯的熔点优选巧5〜175°C。 Qiao melting point of polypropylene is preferably 5~175 ° C. 这样的聚丙烯以具有上述形状及粒径的微粒， 分散于上述（a)〜（c)的自聚体或组合物中。 Such a particulate polypropylene having the above shape and particle size, dispersed in the above (a) ~ (c) self-mer or composition. 因此，构成多孔层A的原纤维以聚丙烯微粒为中心开裂，并形成由裂纹状空隙构成的细孔。 Accordingly, constituting the porous layer A particulate polypropylene fibrils center cracks, pores and constituted by forming crack-like voids. 聚甲基戊烯基本上是由4-甲基-1-戊烯、2-甲基-1-戊烯、2-甲基_2_戊烯、 3-甲基-1-戊烯及3-甲基-2-戊烯中的任一种构成的聚烯烃，但优选4-甲基-1-戊烯的自聚体。  polymethylpentene consisting essentially of 4-methyl-1-pentene, 2-methyl-1-pentene, 2-methyl _2_ pentene, 3-methyl-1-pentene polyolefin according to any alkenyl and 3-methyl-2-pentene composed of one, but preferably 4-mer from methyl-1-pentene. 但是，对于聚甲基戊烯而言，在不牺牲耐热性、耐压缩性、耐热收缩性等物性的范围内，也可以为少量含有甲基戊烯以外的其他的α-烯烃的共聚物。 However, for purposes of polymethylpentene, without sacrificing the heat resistance, the range of physical properties of compression resistance, heat shrinkage resistance, etc., may also contain small amounts of other α- olefin copolymer other than methylpentene thereof. 作为甲基戊烯以外的其他的α-烯烃，适合的是乙烯、丙烯、丁烯-1、戊烯-1、己烯-1、辛烯-1、乙酸乙烯酯、甲基丙烯酸甲酯、苯乙烯等。 As another α- olefin other than methyl pentene, suitable are ethylene, propylene, butene-1, pentene-1, hexene-1, octene-1, vinyl acetate, methyl methacrylate, styrene. 聚甲基戊烯的熔点通常是230 〜M5°C。 Polymethylpentene melting point is usually 230 ~M5 ° C. 聚甲基戊烯的Mw尤其优选3X IO5 〜7X105。 Polymethyl pentene is especially preferred Mw 3X IO5 ~7X105. 作为氟树脂，可以举出聚偏氟乙烯（PVDF、熔点：171°C )、聚四氟乙烯（PTFE、熔点： 3270C )、四氟乙烯·全氟烷基乙烯醚共聚物（PFA、熔点：310°C )、四氟乙烯·六氟丙烯·全氟（丙基乙烯醚）共聚物（EPE、熔点：295°C)、四氟乙烯•六氟丙烯共聚物（FEP、熔点： 275°C )、乙烯·四氟乙烯共聚物（ETFE、熔点：270°C )等。  Examples of the fluorine resin include polyvinylidene fluoride (of PVDF, melting point: 171 ° C), polytetrafluoroethylene (the PTFE, melting point: 3270C), tetrafluoroethylene-perfluoroalkyl vinyl ether copolymer (PFA , mp: 310 ° C), tetrafluoroethylene-hexafluoropropylene-perfluoro (propyl vinyl ether) copolymer (EPE, melting point: 295 ° C), tetrafluoroethylene • hexafluoropropylene copolymer (the FEP, melting point: 275 ° C), ethylene-tetrafluoroethylene copolymer (ETFE, melting point: 270 ° C) and the like. 作为氟树脂，优选PVDF。  The fluororesin is preferably PVDF. PVDF也可以为与其他烯烃的共聚物（偏氟乙烯共聚物)。 PVDF may be a copolymer with other olefins (vinylidene fluoride copolymer). 偏氟乙烯共聚物的偏氟乙烯单位含有率优选75质量％以上，更优选90质量％以上。 Vinylidene fluoride copolymer is a vinylidene fluoride unit content is preferably 75 mass% or more, more preferably 90% by mass. 作为与偏氟乙烯共聚的单体的例子，有六氟丙烯、四氟乙烯、三氟丙烯、乙烯、丙烯、异丁烯、 苯乙烯、氯化乙烯、偏氯乙烯、二氟氯代乙烯、甲酸乙烯酯、乙酸乙烯酯、丙酸乙烯酯、丁酸乙烯酯、丙烯酸及其盐、甲基丙烯酸甲酯、甲基丙烯酸烯丙基酯、丙烯腈、甲基丙烯腈、N- 丁氧基甲基丙烯酰胺、乙酸烯丙基酯、乙酸异丙烯酯等。 Examples of the monomer copolymerizable with vinylidene fluoride with hexafluoropropylene, tetrafluoroethylene, trifluoropropylene, ethylene, propylene, isobutylene, styrene, vinyl chloride, vinylidene chloride, vinylidene fluorochloroalkyl ethylene, vinyl formate, vinyl ester, vinyl acetate, vinyl propionate, vinyl butyrate, acrylic acid and its salts, methyl methacrylate, allyl methacrylate, acrylonitrile, methacrylonitrile, N- butoxymethyl acrylamide, allyl acetate, isopropenyl acetate and the like. 作为偏氟乙烯共聚物，优选聚（六氟丙烯-偏氟乙烯）共聚物。 As a vinylidene fluoride copolymer, preferably a poly (hexafluoropropylene - vinylidene fluoride) copolymer. 作为聚酰胺，优选使用选自聚酰胺6 (6-尼龙）、聚酰胺66 (6,6-尼龙）、聚酰胺12(12-尼龙）及非晶型聚酰胺构成的组中的至少一种。  As the polyamide, preferably selected from polyamide 6 (6-nylon), polyamide 66 (6,6-nylon), polyamide 12 group (12-nylon) and amorphous polyamide in at least one. 作为聚亚芳基硫醚，优选使用聚苯硫醚（PES、熔点：285°C )。  As polyarylene sulfide, preferably polyphenylene sulfide (the PES, mp: 285 ° C). 聚苯硫醚可以使用线状或支化状的任一种。 Polyphenylene sulfide may be used either linear or branched form. 耐热性树脂的比例在将耐热性聚乙烯系树脂组合物A全部作为100质量％的情况下优选3〜30重量％，更优选5〜25质量％。  The ratio of the heat-resistant resin in the heat-resistant polyethylene resin composition A entirety 100 mass% preferably 3~30 wt%, more preferably 5~25% by mass. 若该含量大于30质量％，则扎透强度、拉伸断裂强度及膜的平滑性降低。 If the content is more than 30% by mass, the pierce strength, tensile breaking strength and smoothness of the film decreases. Mw/Mn是分子量分布的标准，该值越大，分子量分布的范围越大。  Mw / Mn is a standard molecular weight distribution, the larger the value, the greater the range of molecular weight distribution. 不限定聚乙烯系树脂A的Mw/Mn，但在聚乙烯系树脂A由高密度聚乙烯A构成的情况下、或在由聚乙烯组合物A构成的情况下，优选5〜300，更优选5〜100。 A polyethylene-based resin is not limited to the Mw / Mn, in the case of the polyethylene resin A comprising high-density polyethylene A or in the case of polyethylene composition consisting of A, preferably 5~300, more preferably 5~100. 若该分子量分布在5〜300的范围内， 则能够进一步增大多孔层A的平均细孔径。 If the molecular weight distribution of the average pore size in the range of 5~300, it is possible to further increase the porous layer A. 通过多阶段聚合，可以适当调节聚乙烯（自聚体或乙烯· α-烯烃共聚物）的Mw/Mn。 By a multistage polymerization can be appropriately adjusted polyethylene (or polyethylene from ethylene · α- olefin copolymer) Mw / Mn. 作为多阶段聚合法，优选在第一阶段中，生成高分子量聚合物成分，在第二阶段中，生成低分子量聚合物成分的两阶段聚合。 As a multi-stage polymerization, preferably in the first stage, a high molecular weight polymer component in the second stage, to generate two-phase polymerization of low-molecular weight polymer component. 在聚乙烯组合物A的情况下，Mw/Mn越大，超高分子量聚乙烯和其他的聚乙烯的Mw差越大，相反的情况下越小。 In the case of the polyethylene composition A, Mw / Mn, the greater the difference between the Mw of the high molecular weight polyethylene and other polyethylene, the smaller the opposite case. 聚乙烯组合物A的Mw/Mn可以根据各成分的分子量及混合比例来适当调节。 Mw / Mn of the polyethylene composition A can be appropriately adjusted depending on the molecular weight and the mixing ratio of each component. 形成多层多微孔膜的聚乙烯系树脂多孔层B(以下，没有特别限定的情况下称为“多孔层B”）的聚乙烯系树脂B为（a)利用红外分光法测定的末端乙烯基浓度在每10，000 个碳原子中小于0.2个的高密度聚乙烯B; (b)高密度聚乙烯B和其以外的聚乙烯的混合物(聚乙烯组合物B) ； (c)这些（a)或（b)和聚乙烯、聚丙烯及聚甲基戊烯以外的聚烯烃的混合物（聚烯烃组合物B)；或（d)这些（a)〜（c)的任一种、熔点或玻璃化转变温度（Tg)为150°C以上的耐热性树脂（耐热性聚乙烯系树脂组合物B)。 Polyethylene resin B  forming a multilayer microporous film porous polyethylene resin layer B (hereinafter, the case is not particularly defined as "porous layer B") is (a) measured by infrared spectroscopy the terminal vinyl group concentration of less than 0.2 per 10,000 carbon atoms in the high-density polyethylene B; mixture (b) high density polyethylene and polyethylene B outside thereof (polyethylene composition B); (C ) mixture (polyolefin composition B) other than the above (a) or (b) and polyethylene, polypropylene and polymethyl pentene polyolefin; or (d) which (a) ~ (c) any one of species, melting point or glass transition temperature (Tg) of not less than 150 ° C heat-resistant resin (heat-resistant polyethylene resin composition B). 高密度聚乙烯B的利用红外分光法测定的末端乙烯基浓度在每10，000个碳原子中小于0. 2个。 Determination of  B is a high density polyethylene by infrared spectroscopy terminal vinyl group concentration of less than 0.2 per 10,000 carbon atoms. 若该末端乙烯基浓度为0. 2个以上，则多微孔膜的透过性及机械强度不充分。 If the terminal vinyl group concentration of less than 0.2, the microporous membrane permeability and mechanical strength is insufficient. 该末端乙烯基浓度优选0.15个以下。 The terminal vinyl group concentration is preferably 0.15 or less. 高密度聚乙烯B的末端乙烯基浓度也上述相同地求出。 High-density polyethylene B terminal vinyl group concentration is also determined in the same manner described above. 高密度聚乙烯B的Mw及密度与高密度聚乙烯A相同也可。  Mw density and high-density polyethylene and high density polyethylene B A may be the same. 若将高密度聚乙烯B 的Mw设为5 X IO5以下，则能够进一步增大多孔层B的平均细孔径。 If Mw of the high-density polyethylene B is set to 5 X IO5 or less, it is possible to further increase the average pore diameter of the porous layer B. 高密度聚乙烯B优选均聚物，但与高密度聚乙烯A相同地，也可以为含有少量其他的α -烯烃的共聚物。 B is preferably a high density polyethylene homopolymer, high density polyethylene but A in the same manner, as may contain small amounts of other α - olefin copolymer. 如上所述的高密度聚乙烯B例如可以利用特公平1-12777号中记载的方法来制造。  As described above, for example, high-density polyethylene B method may utilize Kokoku No. 1-12777 disclosed manufactured. 若利用特公平1-12777号中记载的方法，则能够使用镁化合物系齐格勒（Ziegler)型催化剂，利用悬浮聚合、溶液聚合或气相聚合来制造乙烯。 If the method described in Kokoku No. 1-12777 use, it is possible to use (of Ziegler) a magnesium compound-based Ziegler-type catalyst, by suspension polymerization, solution polymerization or gas phase polymerization of ethylene produced. 聚乙烯组合物B是高密度聚乙烯B和其以外的聚乙烯的混合物。  The polyethylene composition B is a mixture of a high density polyethylene and polyethylene B outside thereof. 高密度聚乙烯B 与上述相同也可。 High-density polyethylene B can be the same as above. 作为高密度聚乙烯B以外的聚乙烯，与上述聚乙烯组合物A中的高密度聚乙烯A以外的聚乙烯相同也可。 As the polyethylene other than high-density polyethylene B, and the polyethylene composition A polyethylene of high density polyethylene than A may be the same. 作为聚乙烯组合物B，优选包括高密度聚乙烯B和上述超高分子量聚乙烯的组合物。 As the polyethylene composition B, preferably B comprises a high density polyethylene ultrahigh molecular weight polyethylene and said composition. 聚乙烯组合物B的Mw与聚乙烯组合物A相同也可。 The polyethylene composition B identical Mw and A polyethylene composition may be used. 若将聚乙烯组合物B的Mw设为1 X IO6以下，则能够进一步增大多孔层B的平均细孔径。 If Mw of the polyethylene composition B is defined as 1 X IO6 or less, it is possible to further increase the average pore diameter of the porous layer B. 聚乙烯组合物B中的高密度聚乙烯B以外的聚乙烯的比例在将聚乙烯组合物B全部设为100质量％的情况下优选为1质量％以上，更优选2〜50质量％。  The proportion of the polyethylene composition B is polyethylene, high-density polyethylene B than in the case where all of the polyethylene composition B is 100% by mass is preferably 1 mass% or more, more preferably 2~50 mass %. 聚烯烃树脂B是高密度聚乙烯B或聚乙烯组合物B、和聚乙烯、聚丙烯及聚甲基戊烯以外的聚烯烃的混合物。  The polyolefin resin (B) is a mixture of high-density polyethylene B or the polyolefin other than polyethylene composition B, and polyethylene, polypropylene, and polymethylpentene. 高密度聚乙烯B、聚乙烯组合物B、和聚乙烯、聚丙烯及聚甲基戊烯以外的聚烯烃与上述相同。 HDPE polyolefin same as described above except B, the polyethylene composition B, and polyethylene, polypropylene, and polymethylpentene. 聚乙烯、聚丙烯及聚甲基戊烯以外的聚烯烃的比例在将聚烯烃组合物B全部作为100质量％的情况下，优选20质量％以下，更优选10质量％以下。 Proportion of the polyolefin other than polyethylene, polypropylene and polymethyl pentene in the case where all of the polyolefin composition B as 100% by mass, preferably 20% by mass or less, more preferably 10 mass% or less. 耐热性聚乙烯系树脂组合物B是上述（a)〜（C)的任一种、和熔点或玻璃化转变温度（Tg)为150°C以上的耐热性树脂的混合物。  The heat-resistant polyethylene resin composition B is above (a) ~ (C) of any one, and a melting point or glass transition temperature (Tg) of 150 ° C or more a mixture of heat-resistant resin. 耐热性树脂及其配合比例与耐热性聚乙烯系树脂组合物A相同。 Their mixing ratio of heat-resistant resin and heat-resistant polyethylene resin composition was the same as A. 聚乙烯系树脂B的Mw/Mn在聚乙烯系树脂B包括高密度聚乙烯B的情况下、或包括聚乙烯组合物B的情况下，优选5〜300，更优选5〜100，尤其优选5〜25。  In the case where the polyethylene resin B comprising high-density polyethylene B or the polyethylene composition B includes a case where the polyethylene resin B Mw / Mn, preferably 5~300, more preferably 5~100, Especially preferably 5~25. 若分子量分布为5〜300的范围内，则能够进一步增大多孔层B的平均细孔径。 When the molecular weight distribution in the range of 5~300, it is possible to further increase the average pore diameter of the porous layer B. 分子量分布的调节方法如上所述。 The method of adjusting the molecular weight distribution as described above. 向聚乙烯系树脂A及B中添加填充材料也可。  The filler is added to the polyethylene resin A and B may be used. 作为填充材料，可以举出无机填充材料及有机填充材料。 Examples of the filler include an inorganic filler and an organic filler. 作为无机填充材料，可以举出硅石、氧化铝、硅石-氧化铝、沸石、云母、粘土、高岭土、滑石、碳酸钙、氧化钙、硫酸钙、碳酸钡、硫酸钡、碳酸镁、硫酸镁、氧化镁、 硅藻土、玻璃粉末、氢氧化铝、二氧化钛、氧化锌、缎光白、酸性白土等。 Examples of the inorganic filler may include silica, alumina, silica - alumina, zeolite, mica, clay, kaolin, talc, calcium carbonate, calcium oxide, calcium sulfate, barium carbonate, barium sulfate, magnesium carbonate, magnesium oxide, magnesium, diatomaceous earth, glass powder, aluminum hydroxide, titanium dioxide, zinc oxide, satin white, acid clay and the like. 无机填充材料不限于一种，可以合用多种。 The inorganic filler is not limited to one, more may be used together. 其中，优选使用硅石及/或碳酸钙。 Among these, silica and / or calcium carbonate. 作为有机填充材料，优选包括上述耐热性树脂的材料。 As the organic filler, preferably comprising a material of the heat-resistant resin. 填充材料的粒子不特别限定。  The filler particles is not particularly limited. 例如，可以适当选择球状、破碎状等填充材料，但优选球状。 For example, a spherical shape may be appropriately selected, crushed filler and the like, but preferably spherical. 填充材料的粒径优选0. 1〜15 μ m，更优选0. 5〜10 μ m。 Particle size of the filler is preferably 0. 1~15 μ m, and more preferably 0. 5~10 μ m. 填充材料可以被表面处理。 The filler material may be surface-treated. 作为填充材料的表面处理剂，例如，可以举出各种硅烷偶合剂或脂肪酸（例如，硬脂酸等）或其衍生物等。 As the surface treatment agent, filler, for example, include various silane coupling agent or a fatty acid (e.g., stearic acid) or derivatives thereof. 通过向聚乙烯系树脂A及B的任一种中填充填充材料，进一步提高电解液吸收性。  filled with a filling material by any one of the polyethylene-based resin A and B, to further improve the electrolytic solution absorbability. 这推测如下：若添加填充材料，则通过构成多孔层的原纤维以填充材料粒子为中心开裂，形成裂纹状空隙（细孔），空隙（细孔）溶剂进一步增加。 This is assumed as follows: Addition of filler material, the filler material to the particles constituting the porous layer by cracking the center fibril forming crack-like voids (pores), voids (pores) solvent further increased. 推测填充材料粒子被保持在这样的细孔中。 It speculated that filler particles are held in such pores. 填充材料的添加量在向聚乙烯系树脂A或B的任一种中添加的情况下，也优选将聚乙烯系树脂及填充材料的总计设为100质量份的情况下的0. 1〜5质量份，更优选0. 5〜 3质量份。  The added amount of the filler added to the case in any one of polyethylene-based resin, A or B, it is also preferred that the polyethylene resin and the filler is set to 0 in the case where the total 100 parts by mass. 1 ~ 5 parts by mass, and more preferably 0.05 -5 to 3 parts by mass. 若该含量大于5质量份，则扎透强度及压缩时的变形性降低，切割时的填充材料的脱落增加。 If the deformation is reduced when the content is more than 5 parts by mass, the compressive strength and pierce, cut filler material during off increases. 若填充材料脱落而产生的粉末多，则存在多层多微孔膜制品中发生针孔（孔） 或黑点（杂质）等缺陷之患。 If the generated multiple powder filler shedding suffering pinhole defects (holes) or black dots (impurity), etc. occurs in the multilayer microporous film article is present. 作为本发明的制造聚乙烯多层多微孔膜的第一制造方法包括：(1)熔融混炼上述聚乙烯系树脂A及B各自和成膜用溶剂，配制聚乙烯系树脂溶液A及B的工序；(2)由模头同时地挤出聚乙烯系树脂溶液A及B的工序；（3)冷却挤出成形体，形成凝胶状层叠片；⑷ 从各凝胶状层叠片中除去成膜用溶剂的工序；及（¾干燥工序。根据需要，可以在工序（4) 前设置拉伸工序、热固定处理工序、热辊处理工序及热溶剂处理工序的任一个。进而，在工序（¾后，设置再拉伸工序、热处理工序、热溶剂处理工序、基于电离辐射的交联处理工序、 亲水化处理工序、表面被覆处理工序等。  As a method for manufacturing a first manufacturing multilayer microporous polyethylene film of the present invention comprises: (1) melt-kneading the raw polyethylene resin A and B each with a solvent and forming to prepare a polyethylene resin solution step a and B; (2) the step of simultaneously extruding the polyethylene resin solutions a and B from the die; (3) cooling the extruded body, forming a gel-like laminate sheet; ⑷ from each of the gel-like laminate the solvent was removed by film forming step;.. and (¾ drying step necessary, in the step () is provided either before the stretching process and thermal treatment step, the heat roll treatment step and a hot solvent treatment step of further 4 after step (¾, provided redraw step, heat treatment step, a hot solvent treatment step, based on the ionizing radiation crosslinking process, the hydrophilic treatment step, the step of surface coating treatment and the like. 向上述聚乙烯系树脂A及B的各自中适当添加成膜用溶剂，然后将其熔融混炼，配制聚乙烯系树脂溶液（以下，没有特别的限定的情况下，简称为“树脂溶液”）A及B。  to the polyethylene-based resins A and B in each of the film-forming solvent is appropriately added, then melt-kneaded to prepare a polyethylene resin solution (hereinafter, the case is not particularly limited, simply referred to as "resin solution ") A and B. 在不牺牲本发明的效果的范围内，可以根据需要，向树脂溶液A及B中添加上述填充剂、抗氧化剂、紫外线吸收剂、防结块剂、颜料、染料等各种添加剂。 Without sacrificing the effect of the present invention scope, as needed, various additives of the filler, an antioxidant, an ultraviolet absorber, anti-blocking agents, pigments, dyes and the like to the resin solution A and B. 例如，作为孔形成剂，可以添加微粉硅酸。 For example, as a pore-forming agent, fine powder silicic acid may be added. 成膜用溶剂优选在室温下为液体。  The film-forming solvent is preferably liquid at room temperature. 通过使用液体溶剂，能够进行比较高的倍率的拉伸。 By using a liquid solvent, can be relatively high stretching ratio. 作为液体溶剂，可以举出壬烷、癸烷、十氢萘、对二甲苯、十一烷、十二烷、液体石蜡等链状或环式脂肪族烃、及沸点与这些对应的矿物油馏分、以及二丁基酞酸酯、二辛基酞酸酯等在室温下为液态的酞酸酯。 As liquid solvents include nonane, decane, decalin, p-xylene, undecane, dodecane, liquid paraffin chain or cyclic aliphatic hydrocarbon, boiling point fraction and a mineral oil corresponding to these , and dibutyl phthalate, dioctyl phthalate and the like which is liquid at room temperature phthalate. 为了得到液体溶剂的含量稳定的凝胶状层叠片，优选使用液体石蜡之类的不挥发性液体溶剂。 In order to obtain a stable liquid solvent content of the gel-like laminate sheet, it is preferable to use a non-volatile liquid solvent such as liquid paraffin. 另外，在熔融混炼状态下，与聚乙烯系树脂A及B混合， 但在室温下，向液体溶剂中混合固体溶剂也可。 Further, kneading in a molten state, the resin mixed with polyethylene A and B, but at room temperature, a mixed solvent solid to liquid solvent may be used. 作为这样的固体溶剂，可以举出硬脂醇、蜡醇、固体石蜡等。 Such a solid solvent include stearyl alcohol, cetyl alcohol, solid paraffin and the like. 但是，若仅使用固体溶剂，则存在发生拉伸不均等之患。 However, when only the solid solvent is used, there occurs unevenness in stretching and the like of patients. 液体溶剂的粘度在25°C下优选30〜500(3¾,更优选50〜200(3¾。若在25°C下的粘度小于30cSt，则树脂溶液A及B的自模唇的喷出不均，且难以混炼。另一方面，若大于500cSt，则难以除去液体溶剂。 Spray  viscosity of the liquid solvent at 25 ° C preferably 30~500 (3¾, more preferably 50~200 (3¾. If the viscosity at 25 ° C and less than 30cSt, the resin from the die lip of the solutions A and B the unevenness, and kneading is difficult. On the other hand, if it exceeds 500 cSt, it is difficult to remove the liquid solvent. 树脂溶液A及B的均一的熔融混炼不特别限定，但优选在双螺杆挤出机中进行。  The homogeneous melt-kneaded resin solution A and B is not particularly limited, but preferably in a twin screw extruder. 在双螺杆挤出机中的熔融混炼适合配制高浓度的树脂溶液A及B。 Melted in a twin screw extruder for kneading a resin solution A formulation of high concentration and B. 树脂溶液A的熔融混炼温度优选聚乙烯系树脂A的熔点Tma+10°C〜熔点Tma+100°C。 Melting point Tma melt kneading temperature is preferably a polyethylene resin solution A A resin melting point of + 10 ° C~ Tma + 100 ° C. 聚乙烯系树脂A的熔点Tma在聚乙烯系树脂A为高密度聚乙烯A或聚乙烯组合物A的情况下为这些的熔点，在聚乙烯系树脂A为聚烯烃组合物A或耐热性聚乙烯系树脂组合物A的情况下为高密度聚乙烯A或聚乙烯组合物A中包含聚烯烃组合物A或耐热性聚乙烯系树脂组合物A的物质的熔点（下同）。 Melting point Tma of the polyethylene resin A is in the case of high-density polyethylene A or the polyethylene composition A polyethylene resin A is the melting point of the polyethylene resin A is the polyolefin composition A or the heat resistance melting point of the material in the case where the polyethylene resin composition a comprising the polyolefin composition a or the heat-resistant polyethylene resin composition a high-density polyethylene a or the polyethylene composition a (the same below). 树脂溶液B的熔融混炼温度优选聚乙烯系树脂B的熔点Tmb+10°C〜熔点Tmb+10(TC。聚乙烯系树脂B的熔点Tmb在聚乙烯系树脂B为高密度聚乙烯B或聚乙烯组合物B的情况下为这些的熔点，在聚乙烯系树脂B为聚烯烃组合物B或耐热性聚乙烯系树脂组合物B的情况下为高密度聚乙烯B或聚乙烯组合物B中包含聚烯烃组合物B或耐热性聚乙烯系树脂组合物B的物质的熔点（下同）。 Melting point Tmb melt kneading temperature is preferably a polyethylene resin solution B-based resin B + 10 ° C~ melting point Tmb + 10 (TC. Melting point Tmb of the polyethylene resin B is the polyethylene resin B is the high-density polyethylene B or a case where the case of polyethylene composition B for these melting point of the polyethylene resin B is the polyolefin composition B or the heat-resistant polyethylene resin composition B or the polyethylene composition B is a high density polyethylene composition melting point of the substance B includes a polyolefin composition B or the heat-resistant polyethylene resin composition B (the same applies hereinafter). 高密度聚乙烯A及B、及聚乙烯系组合物A及B具有约130〜140°C的熔点。  A and B, high density polyethylene, and polyethylene-based compositions A and B having a melting point of about 130~140 ° C. 从而， 熔融混炼温度优选140〜250°C，更优选170〜240°C。 Thus, the melt kneading temperature is preferably 140~250 ° C, more preferably 170~240 ° C. 但是，在聚乙烯系树脂A为耐热性聚乙烯系树脂组合物A的情况下，熔融混炼温度更优选耐热性树脂的熔点〜熔点+100°C， 尤其优选耐热性树脂的熔点〜上述熔点Tma+100°C。 However, in the case where the polyethylene resin A is the heat-resistant polyethylene resin composition A, the melt-kneading temperature is more preferably heat-resistant resin melting point to the melting point + 100 ° C, in particular melting point it is preferably heat resistant resin ~ above the melting point Tma + 100 ° C. 在聚乙烯系树脂B为耐热性聚乙烯系树脂组合物B的情况下，熔融混炼温度更优选耐热性树脂的熔点〜熔点+100°C，尤其优选耐热性树脂的熔点〜上述熔点Tmb+100°C。 In the case where the polyethylene resin B is the heat-resistant polyethylene resin composition B, preferably melt-kneading temperature is more heat-resistant resin melting point to the melting point + 100 ° C, in particular melting point is preferably the above-described heat resistant resin - melting point Tmb + 100 ° C. 在混炼开始前添加成膜用溶剂也可，在混炼中从双螺杆挤出机的中途添加也可，但优选后者。 Add the film-forming solvent before the start may be kneaded in the kneading can also be added from the middle of the twin screw extruder, but preferably the latter. 为了在熔融混炼时防止聚乙烯系树脂A及B 的氧化，优选添加抗氧化剂。 In order to prevent oxidation of the polyethylene resins A and B during the melt-kneading, it is preferred to add an antioxidant. 树脂溶液A及B的树脂浓度在将聚乙烯系树脂和成膜用溶剂的总计设为100质量％的情况下，聚乙烯系树脂均为10〜50质量％，优选25〜45质量％。 In the case  The resin concentration of the resin solution A and B in the film-forming polyethylene-based resin and a solvent to total 100% by mass of the polyethylene resin are 10~50 wt%, preferably 25~45 mass %. 若聚乙烯系树脂的比例小于10质量％，则生产率降低，因此不优选。 If the ratio of the polyethylene resin is less than 10% by mass, the productivity is lowered, which is not preferable. 而且，在挤出树脂溶液A及B时，在挤压模出口的膨胀（swell)或缩幅加大，凝胶状层叠成形体的成形性及自支撑性降低。 Further, when the extruded resin solutions A and B, the expansion extrusion die outlet (Swell) increase or neck, gel-like laminated molded moldability and lower self-supporting. 另一方面，若聚乙烯系树脂的比例大于50质量％，则降低凝胶状层叠成形体的成形性。 On the other hand, when the ratio of the polyethylene-based resin is more than 50 mass%, the moldability reduced gel-like laminated molded article. 若使树脂溶液A及B的树脂浓度存在差异，则得到具有平均细孔径在膜厚方向上发生变化的结构（倾斜结构）。  Ruoshi differences in concentration of the resin solution A and the resin B, the structure (inclined structure) changes in the thickness direction has a mean pore size. 使用浓度较低的树脂溶液形成的层的平均细孔径变得比使用浓度较高的树脂溶液形成的层的平均细孔径大。 Concentration lower resin solution layer formed of the average pore size becomes larger than the average pore size layer using a higher concentration of the resin solution formed. 可以根据对多层多微孔膜要求的物性， 适当选择增加树脂溶液A或B中的哪一个的浓度。 Depending on physical properties of the multilayer microporous film claims, appropriately selected to increase concentration of the resin solution A or B in which one. 树脂溶液A及B的树脂浓度差优选5质量％以上，更优选10质量％以上。 Resin concentration of the resin solution A and B, the difference is preferably 5% by mass or more, more preferably 10% by mass or more. 经由各挤出机从模头同时挤出树脂溶液A及B。  through each extruder are simultaneously extruded from the die the resin solution A and B. 在树脂溶液A及B的同时挤出中， 在一个模头内将两溶液组合为层状，挤出为（模头内粘接）片状的情况下，一个模头连接多个挤出机，另外，将两溶液从各自的模头挤出为片状，层叠（模头外粘接）的情况下，将模头分别连接于多个挤出机。 While the resin solution A and B extruded in a die in a combination of two laminar solution, extruded (die head bonding) the sheet-like case, a plurality of connector die extruders case, further, the two solutions were extruded from the respective die into a sheet, laminated (bonding outside the die) of the die are connected to a plurality of extruders. 更优选模头内粘接。 More preferably the die adhesive. 在同时挤出中使用平模头法及吹塑法的任一种也可。  Using any of a flat die method and an inflation method while the extrusion of one may be used. 在任意一种方法中，模头内粘接时，可以使用，向多层用模头的各歧管供给各溶液从而在模唇入口以层状层叠的方法(多数歧管法），或者预先使溶液以层状流动并向模头供给的方法（模块（block)法）的任意一种。 In either method, when the die bonding, may be used, each solution supplied to each manifold with a multilayer die so that the tube inlet lip stacked in a layered method (most manifold method), or pre- the solution to any of a laminar flow supplied to the die method (module (block) method). 多数歧管法以及模块法本身为公知的方法，所以省略它们的详细说明。 Most of the manifold method and the block method per se known method, detailed description thereof will be omitted. 例如可以使用公知的多层用平模头及吹塑薄膜机头。 For example using a known multi-layer die head with a flat and blown film. 多层用平模头的间距通常优选为0. 1〜5mm的范围内。 Typically with multilayer flat dies pitch is preferably within a range of 0. 1~5mm. 利用平模头法进行模头外粘接的情况下，通过使从各模头挤出的片材状溶液通过一对辊间来进行压接。 An outer case of a die bonding method using a flat die, the crimping is performed by respective extruded from the die was shaped by a sheet between a pair of rollers. 在上述任意一种方法中，模头在挤出时加热至140〜250°C的温度。 In any of the above method, the die is heated to a temperature of 140~250 ° C during extrusion. 加热溶液的挤出速度优选在0. 2〜15m/分的范围内。 The solution was heated extrusion speed is preferably in the range of 0. 2~15m / min. 通过调节树脂溶液A及B的各挤出量，可以调节多孔层A及B的比例。 By adjusting the amount of extrusion of each resin solutions A and B may adjust the ratio of A and B porous layer. 通过冷却挤出得到的层状挤出成形体，得到凝胶状层叠片。  The extrusion molded article obtained by cooling the extruded layer, gel-like laminate sheet. 优选冷却至少在凝胶化温度以下为止，以50°C /分钟的速度进行。 Preferably cooling at least until the gelation temperature, at a speed of 50 ° C / min. 通过进行这样的冷却，能够固定化聚乙烯系树脂A及B的相被成膜用溶剂微相分离的结构，另外，优选冷却至25°C以下。 By performing such cooling, can be immobilized polyethylene-based resin A and phase B is a solvent for forming a microphase-separated structure, and is preferably cooled to below 25 ° C. 通常，若使冷却速度慢，则疑似细胞单元变大，得到的凝胶状层叠片的超级结构变得粗大，但如果使冷却速度快，则形成密集的细胞单位。 Typically, when the cooling rate, the suspected cell unit becomes large, gel-like laminate sheet super-structure obtained is coarse, but if the cooling speed is formed dense cell units. 在冷却速度小于50°C /分钟的情况下，结晶化度上升，难以形成为适合拉伸的凝胶状层叠片。 In the case where the cooling rate is less than 50 ° C / min, the degree of crystallinity increases, it is difficult to form a gel-like laminate sheet suitable for stretching. 作为冷却方法，可以使用与冷风、冷却水等制冷剂接触的方法、与冷却辊接触的方法等。 As a cooling method, a method may be used in contact with the cold air, a refrigerant such as cooling water, a method of contact with the cooling roll. 在成膜用溶剂的除去（清洗）中使用清洗溶剂。  In the film-forming solvent is removed (washed) using cleaning solvents. 聚乙烯系树脂A相及B相与成膜用溶剂相分离，因此，若除去液体溶剂，则得到多孔膜。 Polyethylene-based resin forming the A-phase and B phase with a solvent phase separation, and therefore, when the removal of the liquid solvent, a porous film is obtained. 可以使用公知的清洗溶剂进行液体溶剂的除去（清洗）。 It may be a known liquid solvent cleaning solvent removal (cleaning). 作为清洗溶剂，例如，可以举出戊烷、己烷、庚烷等饱和烃、二氯甲烷、 四氯化碳等氯代烃、二乙醚、二噁烷等醚类、丁酮等酮类、三氟代乙烷、C6F14, C7F16等链状氟代碳、C5H3F7等环状氢氟碳、C4F9OCH3^ C4F9OC2H5等氢氟醚、C4F9OCF3^ C4F9OC2F5等全氟醚等易挥发性溶剂。 As a cleaning solvent, for example, include pentane, hexane, heptane, saturated hydrocarbons, methylene chloride, carbon tetrachloride, chlorinated hydrocarbons, diethyl ether, and dioxane, ketones such as methyl ethyl ketone, trifluoroethane, C6F14, C7F16, etc. fluorocarbon chain, C5H3F7 cyclic hydrofluorocarbons, C4F9OCH3 ^ C4F9OC2H5 like hydrofluoroethers, C4F9OCF3 ^ C4F9OC2F5 perfluoro ether volatile solvents. 这些清洗溶剂具有低的表面张力（例如，在25°C下为24mN/m以下）。 These washing solvents have a low surface tension (e.g., at 25 ° C, 24mN / m or less). 通过使用低表面张力的清洗溶剂，形成多微孔的网状组织因清洗后的干燥时的气液界面的表面张力的收缩得以抑制，因此，得到具有高空孔率及透过性的多层多微孔膜。 Cleaned by use of a low surface tension solvent to form a microporous meshwork surface tension due to the contraction of the gas-liquid interface during drying after washing is suppressed, and therefore, a multilayer having high porosity and permeability of the multi- microporous membrane. 凝胶状层叠片的清洗可以利用浸渍于清洗溶剂中的方法、喷淋清洗溶剂的方法、 或它们的组合来进行。  Cleaning using a gel-like laminate sheet can be immersed in a solvent in the washing solvent cleaning spray method, or a combination thereof is performed. 清洗溶剂相对于拉伸后的膜100质量份，优选使用300〜30，000质量份。 Cleaning solvent 100 parts by mass with respect to the stretched film is preferably used 300~30,000 parts by mass. 利用清洗溶剂的清洗优选进行至液体溶剂的残留量达到小于初始的添加量的1质量％为止。 Amount of residual solvent is washed by the washing liquid is preferably carried out until the solvent reaches less than the initial addition amount of up to 1% by mass. 利用加热干燥法或风干燥，干燥利用成膜用溶剂除去得到的多层多微孔膜。  by heat drying or air drying, drying using a microporous multilayer film formation is removed with a solvent obtained. 干燥温度优选聚乙烯系树脂A的结晶分散温度Tcda及聚乙烯系树脂B的结晶分散温度Tcdb中低的一方的结晶分散温度Tcd以下，尤其优选比结晶分散温度Tcd低5°C以上。 Crystallization crystallization drying temperature is preferably polyethylene-based resin A and the crystal dispersion temperature of the polyethylene-based resin Tcda B Tcdb dispersion temperature of one low dispersion temperature Tcd or less, particularly preferably lower than the crystal dispersion temperature Tcd above 5 ° C. 聚乙烯系树脂A的结晶分散温度Tcda在聚乙烯系树脂A为高密度聚乙烯A或聚乙烯组合物A的情况下为这些的结晶分散温度，在聚乙烯系树脂A为聚烯烃组合物A或耐热性聚乙烯系树脂组合物A的情况下为高密度聚乙烯A或聚乙烯组合物A中包含聚烯烃组合物A或耐热性聚乙烯系树脂组合物A的物质的结晶分散温度（下同）。 Case of crystalline polyethylene based resin dispersion temperature Tcda A polyethylene A or the polyethylene composition A is a high density polyethylene resin A is the crystalline dispersion temperature, the polyethylene resin A is the polyolefin composition A or the case where the heat-resistant polyethylene resin composition a a polyolefin composition comprising a crystalline material or heat-resistant polyethylene resin composition a dispersion temperature of high-density polyethylene a or the polyethylene composition a (hereinafter the same). 聚乙烯系树脂B的结晶分散温度Tcdb 在聚乙烯系树脂B为高密度聚乙烯B或聚乙烯组合物B的情况下为这些的结晶分散温度， 在聚乙烯系树脂B为聚烯烃组合物B或耐热性聚乙烯系树脂组合物B的情况下为高密度聚乙烯B或聚乙烯组合物B中包含聚烯烃组合物B或耐热性聚乙烯系树脂组合物B的物质的结晶分散温度（下同）。 Case of a crystalline polyethylene resin B Tcdb dispersion temperature of polyethylene B or the polyethylene composition B is a high density polyethylene resin B is the crystalline dispersion temperature, the polyethylene resin B is the polyolefin composition B or in case of heat-resistant polyethylene resin composition B or the polyethylene material B in the polyethylene composition B comprises a polyolefin composition B or the heat-resistant polyethylene resin composition B is a high-density crystal dispersion temperature (hereinafter the same). 在此，结晶分散温度是指基于ASTM D 4065，利用动态粘弹性的温度特性测定，求出的值。 Here, the crystallization temperature of the dispersing means 4065, using a dynamic viscoelasticity temperature characteristics measured based on ASTM D, a value obtained. 高密度聚乙烯A及B、及聚乙烯组合物A及B具有约90〜100°C的结晶分散温度。 Crystalline high-density polyethylene A and B, and the polyethylene compositions A and B having a dispersion of about 90~100 ° C temperature. 干燥优选进行至：在将多层多微孔膜作为100质量％ (干燥重量）的情况下，残留清洗溶剂达到5质量％以下，优选达到3质量％以下。  The drying is preferably performed: in the case of the multilayer microporous film as 100 mass% (dry weight) of residual cleaning solvent to 5% by mass or less, preferably 3 mass% or less. 若干燥不充分，则在后续的再拉伸工序或热处理中，多层多微孔膜的空孔率降低，透过性变差，故不优选。 If drying is not sufficient, the subsequent re-stretching or heat treatment step, the porosity of the multilayer microporous film decreases, permeability is deteriorated, which is not preferable. 对在成膜用溶剂除去工序（4)之前的凝胶状层叠片，进行拉伸工序、热固定处理工序、热辊处理工序及热溶剂处理工序中的任一种也可。  The film-forming solvent is removed prior to step (4) laminating the gel-like sheet, stretching step, any heat-treatment step, the heat roll treatment step and a hot solvent treatment step may be in one. 优选凝胶状层叠片在加热后，利用拉幅机法、辊法、吹塑法、压延法或这些方法的组合，以规定的倍率进行拉伸。  Preferred gel-like laminate sheet upon heating by a tenter method, a combination of rollers, blow molding, calendering or combinations of these methods, stretched at a predetermined magnification. 凝胶状层叠片含有成膜用溶剂，因此，能够均一地拉伸。 Gel-like laminate sheet comprising a film-forming solvent, therefore, can be uniformly stretched. 利用拉伸提高机械强度，并且扩大细孔，因此，在用作电池用隔板时尤其优选。 With a tensile improve the mechanical strength, and the expansion of pores, and therefore, when used as a battery separator is particularly preferred. 拉伸可以单轴拉伸，也可以双轴拉伸，但优选双轴拉伸。 The stretching may be uniaxial stretching, biaxial stretching may be, but is preferably biaxially stretched. 在双轴拉伸的情况下，可以进行同时双轴拉伸、逐次拉伸或多级拉伸（例如，同时双轴拉伸及逐次拉伸的组合）的任一种，但特别优选同时双轴拉伸。 In the case of biaxial stretching may be simultaneous biaxial stretching, sequential stretching or multi-stage stretching (e.g., combination of simultaneous biaxial stretching and sequential stretching) of any one, but particularly preferably simultaneously bis biaxial stretching. 拉伸倍率在单轴拉伸的情况下，优选2倍以上，更优选3〜30倍。  In the case where the stretching ratio in monoaxial stretching, more preferably 2 times, more preferably 3~30 times. 在双轴拉伸中， 优选任意方向上至少为3倍以上，面积倍率为9倍以上，更优选面积倍率为25倍以上。 In biaxial stretching, any direction is preferably at least 3 times or more, the area ratio is 9 times or more, and more preferably not less than 25 times the area magnification. 若面积倍率小于9倍，则拉伸不充分，得不到高弹性及高强度的多层多微孔膜。 When the area magnification is less than 9 times, insufficient stretching, the multilayer microporous film is not high elasticity and high strength. 另一方面，若面积倍率大于400倍，则在拉伸装置、拉伸操作等方面产生制约。 On the other hand, if the area ratio is larger than 400 times, the stretching means, the stretching generates constraints aspects of the operation and the like. 拉伸温度优选聚乙烯系树脂A的熔点Tma及聚乙烯系树脂B的熔点Tmb中低的一方的熔点Tm+10°C以下，更优选上述结晶分散温度Tcd以上〜小于上述熔点Tm的范围内。  mp melting point Tma and Tmb of the polyethylene resin B is the stretching temperature is preferably polyethylene-based resin A in a lower one of Tm + 10 ° C or less, and more preferably the crystal dispersion temperature Tcd or more and smaller than the melting point Tm In the range. 若该拉伸温度大于熔点Tm+10°C，则树脂熔融，不能进行根据拉伸的分子链的取向。 If the stretching temperature is greater than the melting point Tm + 10 ° C, melting of the resin, the molecular chains can be oriented in accordance with stretchable. 另一方面，若小于结晶分散温度Tcd，则树脂的软化不充分，由于拉伸而容易导致膜破裂，不能进行高倍率的拉伸。 On the other hand, if less than the crystal dispersion temperature of Tcd, the resin is insufficiently softened, due to the stretching easily lead to rupture, is not a high magnification stretching. 如上所述，高密度聚乙烯A及B、及聚乙烯组合物A及B具有约90〜100°C 的结晶分散温度。 As described above, high-density polyethylene A and B, and the polyethylene compositions A and B have crystal dispersion of about 90~100 ° C temperature. 从而，将拉伸温度通常设为90〜140°C的范围内，优选设为100〜130°C 的范围内。 Accordingly, the stretching temperature is usually set within the range of 90~140 ° C, preferably set within a range of 100~130 ° C.
 通过以上的拉伸，引起聚乙烯结晶片层间的开裂，聚乙烯相（高密度聚乙烯A相或聚乙烯组合物A相及高密度聚乙烯B相或聚乙烯组合物B相）微细化，形成多个原纤维。  By the above stretching causes cracking between the sheets crystalline polyethylene, with polyethylene (high density polyethylene or polyethylene composition A-phase A-phase and B-phase high-density polyethylene or polyethylene composition B Phase ) fine, a plurality of fibrils. 得到的的原纤维形成三维网状结构（三维上不规则地连结的网络结构）。 The resulting fibrils form a three dimensional network structure (network structure three-dimensionally irregularly connected). 另外，在含有耐热性聚乙烯系树脂组合物的层中，以由耐热性树脂构成的微粒为核，原纤维开裂，形成在中心部保持了微粒的裂纹状细孔。 Further, a layer containing a heat-resistant polyethylene resin composition, composed of fine particles of a heat-resistant resin as nuclei, fibrils cracking, a holding portion formed at the center of the crack-like fine pores. 根据所需的物性，在膜厚方向上设置温度分布而拉伸也可，由此得到机械强度进一步出色的多层多微孔膜。  Depending on the desired properties, a temperature distribution may be stretched, thereby obtaining further excellent mechanical strength of the multilayer microporous film in the thickness direction. 尤其，若以使至少一方的表面附近的温度与膜内部相比变高的方式设置温度分布而进行拉伸，则能够增大设为高温的表面附近的细孔径。 In particular, if the inside of the film and the temperature of the vicinity of the surface of at least one high compared to the temperature distribution provided stretching, it is possible to increase the pore diameter is set to a high temperature near the surface. 若放大细孔，则进一步提高周期特性或电解液注液性。 If the enlarged pores to further improve the cycle characteristics or injection of electrolyte. 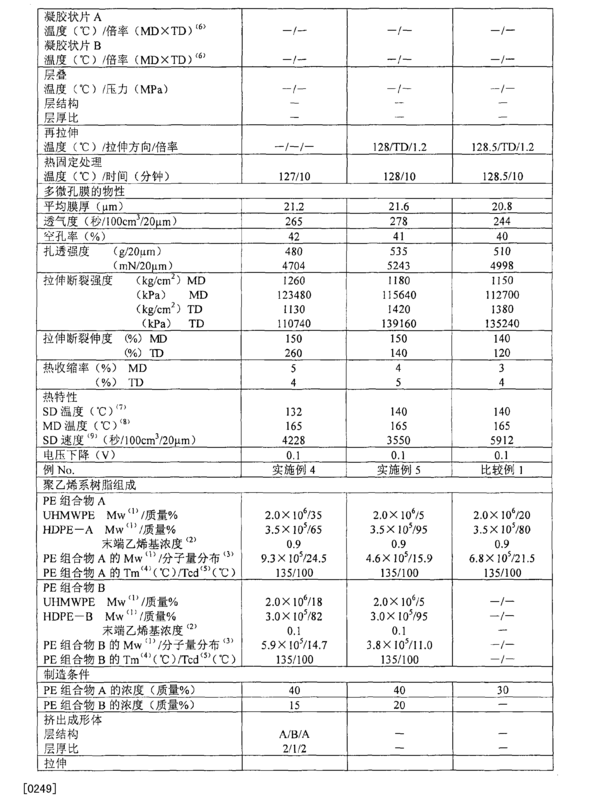 具体来说，该方法记载于日本专利第33478M号中。 Specifically, in the method disclosed in Japanese Patent No. 33478M. 对凝胶状层叠片进行热固定处理也可。  The gel-like laminate sheet can be heat-fixing treatment. 通过该热固定处理，能够改变多层多微孔膜的孔径或空孔率。 By this heat-treatment capable of changing the porosity or pore diameter of the multilayer microporous film. 热固定处理利用拉幅机方式、辊方式或压延方式进行。 Heat-processing using a tenter method, a roll method or calendaring. 热固定处理在上述熔点Tm+10°C以下进行，优选在上述结晶分散温度Tcd以上〜熔点Tm以下的温度范围内进行。 Heat set above the melting point or less Tm + 10 ° C, preferably dispersion temperature Tcd or more to a temperature range for the melting point Tm in the crystal. 对凝胶状层叠片的至少一面实施使其与热辊接触的处理（热辊处理）也可。  The processing (heat roll treatment) make contact with a hot roll may be at least one surface of the gel-like laminate sheet embodiment. 通过热辊处理，能够增大表面附近的细孔径。 By a hot roll treatment, the pore diameter can be increased near the surface. 通过调节辊温度、或辊和膜的接触时间、辊和膜的接触面积率等，能够调节表面附近的细孔径或直径被扩大的层的厚度。 By adjusting the roll temperature, the contact time or the roll and the film, the contact area of ​​the film roll and the like, it is possible to adjust the thickness or diameter of the pore size layer near the surface is enlarged. 辊温度优选上述结晶分散温度Tcd+10°C以上〜小于熔点Tm的范围。  Preferably, the crystallization temperature of the roller dispersion temperature Tcd + 10 ° C ~ less than the above range of melting point Tm. 热辊处理优选对已拉伸的凝胶状层叠片进行。 A heat roll treatment is preferably performed on the stretched gel-like laminate sheet. 加热拉伸的凝胶状层叠片优选在与热辊接触之前，冷却至小于上述结晶分散温度Tcd。 Heating the gel-like laminate sheet is preferably stretched prior to contact with the heat roll, cooled to less than the crystal dispersion temperature Tcd. 对凝胶状层叠片实施与热溶剂接触的处理也可。  The processing of the gel-like laminate sheet with a hot solvent embodiments may also be in contact. 通过热溶剂处理，能够增大多层多微孔膜的表面附近的孔径。 The solvent by heat treatment, the multilayer microporous membrane can be increased pore diameter near the surface. 热溶剂处理优选对已拉伸的凝胶状层叠片进行。 Hot solvent treatment is preferably performed on the stretched gel-like laminate sheet. 作为加热处理用溶剂，优选上述液态成膜用溶剂，更优选液体石蜡。 As the heat treatment with a solvent, preferably the liquid film-forming solvent, more preferably liquid paraffin. 但是，加热处理用溶剂与制造树脂溶液A或B时使用的成膜用溶剂相同也可，不相同也可。 However, the heat treatment with a solvent and the solvent used for the film-forming resin solution A or B for producing the same may, be the same or not. 作为热溶剂处理方法，只要是凝胶状层叠片能够与热溶剂接触的方法，就不特别限定，但例如，可以举出将凝胶状层叠片直接与热溶剂接触的方法（以下，在没有特别限定的情况下，简称为“直接法”）、将凝胶状层叠片与冷溶剂接触的后加热的方法（以下，在没有特别限定的情况下，简称为“间接法”）等。  As the hot solvent treatment method, as long as the method is capable of gel-like laminate sheet in contact with the thermal solvent is not particularly limited, but for example, may include a method of laminating the gel-like sheet into direct contact with a hot solvent (hereinafter , without particularly limited, simply referred to as "direct method"), the method of gel-like laminate sheet was heated in contact with the cold solvent (hereinafter, without particularly limited, simply referred to as "indirect method") Wait. 作为直接法，有将凝胶状层叠片浸渍于热溶剂中的方法、将热溶剂向凝胶状层叠片喷溅的方法、将热溶剂向凝胶状层叠片涂敷的方法等， 但优选浸渍法。 As the direct method, there will be a gel-like laminate sheet was immersed in hot solvent method, sputtering method to a hot solvent to the gel-like laminate sheet, the hot solvent to the gel-like laminate sheet coated method, but is preferably impregnation method. 作为间接法，可以举出将冷溶剂向凝胶状层叠片喷溅，或将冷溶剂向凝胶状层叠片涂敷后，使其与热辊接触，或在烘箱中加热，或将其在热溶剂中浸渍的方法。 As an indirect method include cold solvent to the gel-like laminate sheet sputtering, or cold solvent to the gel-like laminate sheet after coating, so that the hot roll, or heated in an oven, or in which the method of dipping in the hot solvent. 通过适当设定热溶剂处理的温度及时间，能够改变多层多微孔膜的孔径或空孔率。  By appropriately setting the temperature and time of the hot solvent treatment, capable of changing the porosity or pore size of the multilayer microporous film. 热溶剂的温度优选上述结晶分散温度Tcd以上〜上述熔点Tm+10°C以下的范围。 A hot solvent temperature is preferably the crystal dispersion temperature Tcd or more ~ ​​Tm + 10 ° C or less above the melting point range. 具体来说，热溶剂温度优选110〜140°C，更优选115〜135°C。 Specifically, the hot solvent temperature is preferably 110~140 ° C, more preferably 115~135 ° C. 接触时间优选0. 1秒钟〜10分钟，更优选1秒钟〜1分钟。 Contact time is preferably 0.1 seconds ~ 10 minutes, and more preferably 1 sec ~ 1 minute. 若热溶剂温度小于结晶分散温度Tcd，或接触时间小于0. 1秒钟，则热溶剂处理的效果几乎没有，透过性的提高效果小。 When the hot solvent temperature is less than the crystal dispersion temperature of Tcd, or contact time less than 0.1 seconds, the hot solvent treatment effect is almost no effect of improving permeability small. 另一方面，若将热溶剂温度设为大于熔点Tm+10°C，或接触时间设为大于10分钟，则多层多微孔膜的强度降低，或多层多微孔膜破裂，因此不优选。 On the other hand, when the hot solvent temperature is greater than the melting point Tm + 10 ° C, or the contact time was longer than 10 minutes, reducing the strength of the multilayer microporous film, or a multilayer microporous membrane rupture, which is not It preferred. 通过以上的热溶剂处理，还具有利用拉伸形成的原纤维形成为叶脉状，且作为其茎的纤维变得比较粗的效果。  By the above hot solvent treatment, fibrils of the tension also has formed shape is formed as a vein, and as a stem fibers become relatively rough effect. 因此，得到细孔直径大、强度及透过性出色的多层多微孔膜。 Thus, to obtain a large pore diameter, excellent strength and permeability of a multilayer microporous film. 在此，“叶脉状原纤维”是指原纤维由粗的茎纤维和连接于其外方的细纤维构成，细纤维形成复杂的网状结构的状态。 Here, the "vein-like fibrils" means a fibril fiber by the thick stem connected thereto and outwardly fine fibers, the state of a complex network structure formed of fine fibers. 在热溶剂处理后进行清洗，除去残留的加热处理用溶剂，但加热处理用溶剂与成膜用溶剂一同除去即可。  After the hot solvent treatment in water to remove the remaining heat treatment solvent, the heat treatment solvent can be removed together with the film-forming solvent. 在干燥工序（5)后，进行再拉伸工序、热处理工序、热溶剂处理工序、基于电离放射的交联处理工序、亲水化处理工序、表面被覆处理工序等也可。  After the drying step (5), a re-stretching step, a heat treatment step, a hot solvent treatment step, a crosslinking treatment step based on ionizing radiation, a hydrophilic treatment step, the surface treatment coating process or the like may be used. 对清洗、干燥拉伸的凝胶状层叠片后的多层多微孔膜来说，至少沿单轴方向再拉伸也可。  cleaning, the multilayer microporous film after drying the stretched gel-like laminate sheet, at least re-stretching may be uniaxial direction. 可以在加热膜的同时，与上述同样地利用拉幅机法等进行再拉伸。 May, in the same manner as described above using a tenter stretching method or the like and then the film while heating. 再拉伸可以为单轴拉伸，也可以为双轴拉伸。 Re-stretching may be uniaxial stretching, biaxial stretching may be. 在双轴拉伸的情况下，可以为同时双轴拉伸或逐次拉伸中的任一种，但优选同时双轴拉伸。 In the case of biaxial stretching, it may be any of a simultaneous biaxial stretching or sequential stretching, but simultaneous biaxial stretching is preferable. 再拉伸的温度优选上述熔点Tm以下，更优选上述结晶分散温度Tcd〜熔点Tm的范围内。  The re-stretching temperature is preferably above the melting point Tm, and more preferably within a range of the crystal dispersion temperature to the melting point Tm Tcd~. 若再拉伸温度大于熔点Tm，则耐压缩性降低，或在横向（TD)拉伸的情况下，在片宽度方向上物性（尤其透气度）的不均变大。 If more stretching temperature greater than the melting point Tm, the compression resistance is lowered, or in the case of transverse (TD) stretching, in the sheet width direction becomes uneven physical properties (in particular air permeability) is large. 另一方面，若再拉伸温度小于结晶分散温度Tcd，则聚乙烯系树脂A及B的软化不充分，在拉伸中容易发生膜破裂，不能均一地拉伸。 On the other hand, if more stretching temperature less than the crystal dispersion temperature of Tcd, the polyethylene resins A and B is softened insufficiently, film breakage easily occurs during stretching, the stretching can not uniformly. 具体来说，通常将再拉伸温度设在90〜135°C的范围内，优选设在95〜130°C的范围内。 Specifically, the stretching temperature was set Jiangzai generally in the range of 90~135 ° C, preferably set within a range of 95~130 ° C.
 再拉伸的沿单轴方向的倍率优选1. 1〜2. 5倍，由此，进一步增大多层多微孔膜的细孔径，并且进一步提高耐压缩性。  and then stretched in a uniaxial direction is 1 to 2 ratio is preferably 1. 5 times, thereby further increasing the pore size of the multilayer microporous film, and further improve the compression resistance. 例如，在单轴拉伸的情况下，纵向（MD)或横向（TD)上为1. 1〜2. 5倍。 For example, in the case of uniaxial stretching, the longitudinal direction (MD) or transverse direction (TD) ~ 2 to 1. 5 times. 在双轴拉伸的情况下，MD方向及TD方向上分别为1. 1〜2. 5倍。 In the case of biaxial stretching, respectively 1 ~ 2. 5-fold MD direction and the TD direction. 在双轴拉伸的情况下，MD方向及TD方向的各拉伸倍率只要是1. 1〜2. 5倍，MD方向和TD方向上就可以互不相同，但优选相同。 In the case of biaxial stretching, each stretch ratio in the MD direction and the TD direction is as long as 1 ~ 2. 5-fold in MD and TD can be different from each other, but are preferably the same. 若该倍率小于1.1倍，则不能充分提高耐压缩性。 If the ratio is less than 1.1 times, it can not be sufficiently improved compression resistance. 另一方面，若该倍率大于2. 5倍，则膜破裂的可能性高，并且耐热收缩性降低，因此不优选。 On the other hand, if the ratio is greater than a high possibility 2.5 times, the film is broken, and the heat shrinkage resistance decreases, which is not preferable. 再拉伸的倍率更优选1.1〜2.0倍。 Re-stretching magnification is more preferably 1.1~2.0 times. 优选对干燥后的膜进行热处理。  The film is preferably subjected to heat treatment after drying. 通过热处理，使结晶稳定化，片层均一化。 By heat treatment, the crystal stabilized, uniform sheet. 作为热处理方法，使用热固定处理及/或热缓和处理既可。 As a heat treatment method using a thermal fixing treatment and / or thermal relaxation treatment either. 热固定处理与上述相同。 Heat setting process as described above. 热缓和处理除了拉幅机方式、辊方式或压延方式之外，可以使用传送带或气流(air flowding)方式加热炉进行。  In addition to the thermal relaxation treatment tenter method, a roll method or calendaring, may be used conveyor belts or air (air flowding) mode heating furnace. 热缓和处理在上述熔点Tm以下的温度进行，优选在60°C 以上〜熔点Tm-10°C以下的温度范围内进行。 In the thermal relaxation treatment temperature below the melting point Tm, preferably performed within ~ ° C below the melting temperature range of-10 Tm above 60 ° C. 通过上述热缓和处理，得到透过性良好的高强度的多层多微孔膜。 By the heat relaxing treatment, a microporous membrane obtained multilayer high strength good permeability. 另外，组合多个热固定处理及热缓和处理进行也可。 Further, a combination of a plurality of heat fixation treatment and thermal relaxation treatment may be performed. 对干燥后的膜进行热溶剂处理也可。  The dried film after the hot solvent treatment may be performed. 热溶剂处理与上述相同。 Hot solvent treatment described above. 优选对干燥后的多层多微孔膜照射α射线、β射线、、射线、电子束等电离放射线来实施交联处理。  Preferably after drying the multilayer microporous film is irradiated with α-rays, radiation ,, beta] ray, electron beam ionizing radiation for crosslinking treatment. 在照射电子束的情况下，优选0. 1〜IOOMrad的电子束量，优选100〜 300kV的加速电压。 In the case of electron beam irradiation, electron beam amount is preferably 0. 1~IOOMrad, preferably of 100~ 300kV acceleration voltage. 由于交联处理，多层多微孔膜的消融温度上升。 Since the crosslinking treatment, the multilayer microporous film ablation temperature rise. 对干燥后的多层多微孔膜实施亲水化处理也可。  The multilayer microporous film after drying may be hydrophilic treatment. 亲水化处理可以利用单体接枝、 表面活性剂处理、电晕放电等来进行。 The hydrophilic treatment may be carried out using a grafting monomer, a surfactant treatment, a corona discharge. 单体接枝优选在交联处理后进行。 Grafting monomer is preferably performed after the crosslinking treatment. 在表面活性剂处理的情况下，可以使用非离子系表面活性剂、阳离子系表面活性剂、阴离子系表面活性剂或两性离子系表面活性剂中的任一种，但优选非离子系表面活性剂。  In the case of a surface active agent can be used nonionic surfactants, cationic surfactants, anionic surfactants, or any of a zwitterionic surface active agent, but is preferably nonionic Surfactant. 向将表面活性剂溶解于水或甲醇、乙醇、异丙醇等低级醇中而成的溶液中浸渍多层多微孔膜，或利用刮板法向多层多微孔膜涂敷溶液。 To the surfactant is dissolved in the solution impregnating the multilayer microporous film is formed in a lower alcohol or water, methanol, ethanol, isopropanol, etc., or a doctor blade method using a multi-layer coating solution a microporous membrane. 干燥后的多层多微孔膜通过在表面上被覆聚丙烯多孔体、聚偏氟乙烯、聚四氟乙烯等氟系树脂多孔体、聚酰亚胺、聚苯硫醚等多孔体等，提高在用作电池用隔板的情况下的消融特性。  The multilayer microporous film after drying the porous body by coating on the surface of a polypropylene, polyvinylidene fluoride, polytetrafluoroethylene, fluorine-based resin porous body, polyimides, porous polyphenylene sulfide, etc. and the like, to improve the characteristics in the case where the ablation is used as a battery separator. 被覆层用聚丙烯优选Mw为5，000〜500，000的范围内，优选25°C的温度下的相对于IOOg的甲苯的溶解量为0. 5g以上。 Mw polypropylene coating layer is preferably in the range of 5,000~500,000 phase is preferably at a temperature of 25 ° C to dissolve the amount of toluene IOOg is 0. 5g or more. 该聚丙烯更优选外消旋对（recemic dyad)(相连的两个单体单元相互出于镜像异构的关系的结构单元）的分率为0. 12〜0.88。 This polypropylene more preferably racemic (recemic dyad) (two monomeric units are connected to each other for the relationship between the structural units of mirror image isomers) fraction of 0. 12~0.88. 例如，可以通过将含有上述被覆层用树脂和其良溶剂的混合液涂敷于多层多微孔膜，除去良溶剂，提高树脂浓度，从而形成为分离树脂相和良溶剂相的结构后，除去良溶剂的残部，由此，形成表面被覆层。 For example, after the resin with a mixture of a good solvent and which is applied to the multilayer microporous film is formed by the coating layer containing, removing the good solvent, the concentration of the resin is increased, thereby forming a structure with a resin and a good solvent phase is separated, removed remnants of the good solvent, thereby forming the surface coating layer. 第二制造方法包括：(1)配制上述树脂溶液A及B的工序；(2)从模头个别地挤出树脂溶液A及B的工序；(3)冷却挤出成形体A及B，形成凝胶状片A及B的工序；(4)从凝胶状片A及B除去成膜用溶剂，形成聚乙烯多微孔膜A及B的工序；（¾干燥工序；及（6)层叠聚乙烯多微孔膜A及B的工序。根据需要，可以在工序（4)前设置拉伸凝胶状片A及B的任一个的工序、热固定处理工序、热辊处理工序及热溶剂处理工序的任一个。进而，在工序（6)后，设置再拉伸工序、热处理工序、热溶剂处理工序、交联处理工序、亲水化处理工序、表面被覆处理工序等。  The second manufacturing method comprises: (1) a solution preparation step of the resin A and B; (2) process of the resin solution A and B individually extruded from the die; (3) cooling the extruded and molded body A B, gel-like sheet is formed in step a and B; (4) removing the solvent from the film-forming gel-like sheet a and B, a polyethylene microporous film forming step a and B; (¾ drying step; and ( 6) laminating the microporous polyethylene membranes a plurality of step B and according to the need, may be the step (4) is provided before any stretching a gel-like sheet of a and B a step of heat-treatment step, a hot roll treatment step and any of a hot solvent treatment step. further, after the step (6), and then set the stretching step, a heat treatment step, a hot solvent treatment step, crosslinking step, the hydrophilizing treatment step, a surface treatment step of coating and the like. 在上述各工序中，工序（1)与第一方法相同也可，工序O)除了将树脂溶液A及B 个别地从模头挤出这一点之外，与第一方法相同也可，工序（3)除了形成个别的凝胶状片A 及B这一点之外，与第一方法相同也可，工序（4)除了从个别的凝胶状片A及B除去成膜用溶剂这一点之外，与第一方法相同也可，工序（¾除了干燥个别的聚乙烯多微孔膜A及B这一点之外，与第一方法相同也可。但是，在工序（5)中，优选将多微孔膜A及B的干燥温度分别设为上述结晶分散温度Tcda以下及上述结晶分散温度Tcdb以下。干燥温度更优选比结晶分散温度iTcda及Tcdb低5°C以上。  In the above process, Step (1) may be the same as the first method, step O), except that the resin solution A and B individually extruded from the die of this point, the first method may be the same as the step (3) except that a gel-like sheets a and individual B this point, the same method can also be the first step (4) is removed except from the individual a and B forming a gel-like sheet with a solvent which beyond that, the first method may be the same as the step (¾ dried except a polyethylene microporous membrane of the individual a and B for this point, the first method may be the same. However, in the step (5), the drying temperature is preferably a microporous membrane a and B are represented by the following Tcda the crystal dispersion temperature and the crystal dispersion temperature Tcdb the drying temperature is more preferred than the crystalline dispersion temperature of lower than Tcdb iTcda and 5 ° C.
 工序（4)前的拉伸工序、热固定处理工序、热辊处理工序及热溶剂处理工序除了对凝胶状片A及B的任一个实施这一点以外，与第一方法相同也可。  Step stretching step (4) before the heat fixation treatment step, a heat roll treatment step and a hot solvent treatment step in addition to the gel-like sheets A and B according to any one other than this embodiment, is also the same as the first method can. 但是，工序（4)前的拉伸工序中，在拉伸凝胶状片A的情况下，拉伸温度优选上述熔点Tma+10°C以下，更优选结晶分散温度Tcda以上〜小于熔点Tma的范围内。 However, the stretching step (4) prior to the step of, in the case where the gel-like sheet A is stretched, the stretching temperature is preferably above the melting point Tma + 10 ° C or less, and more preferably above the crystalline dispersion temperature to less than the melting point Tma Tcda of range. 在拉伸凝胶状片B的情况下，优选上述熔点Tmb+10°C以下，更优选上述结晶分散温度Tcdb以上〜小于熔点Tmb的范围内。 In the case where the gel-like sheet B is stretched, preferably above the melting point Tmb + 10 ° C or less, and more preferably the crystal dispersion temperature of the above Tcdb ~ the range of less than the melting point Tmb. 工序（4)前的热固定处理工序中，在处理凝胶状片A的情况下，处理温度优选上述熔点Tma+10°C以下，更优选上述结晶分散温度Tcda〜熔点Tma的范围内。 Range before the heat fixation treatment step  Step (4), in the case where the gel-like sheet A process, treatment temperature is preferably above the melting point Tma + 10 ° C or less, and more preferably the crystal dispersion temperature of the melting point Tma of Tcda~ Inside. 在处理凝胶状片B的情况下，优选上述熔点Tmb+10°C以下，更优选上述结晶分散温度Tcdb〜熔点Tmb的范围内。 In the case of gel-like sheet B is treated, preferably above the melting point Tmb + 10 ° C or less, and more preferably within a range of the crystal dispersion temperature of the melting point Tmb of Tcdb~. 工序（4)前的热辊处理工序中，在处理凝胶状片A的情况下，辊温度优选上述结晶分散温度Tcda+10°C以上〜小于熔点Tma的范围内。 The range of a hot roll treatment step before  Step (4), in the case where the processing of the gel-like sheet A roll temperature is preferably the crystal dispersion temperature Tcda + 10 ° C ~ or more than the melting point Tma of. 在处理凝胶状片B的情况下，更优选上述结晶分散温度Tcdb+10°C以上〜小于熔点Tmb的范围内。 In the case of gel-like sheet B is treated, more preferably from the crystal dispersion temperature of the above Tcdb + 10 ° C ~ the range of less than the melting point Tmb. 工序（4)前的热溶剂处理工序中，在处理凝胶状片A的情况下，热溶剂温度优选上述结晶分散温度Tcda〜上述熔点Tma+10°C的范围内。 Hot solvent treatment step before the  Step (4), in the case where the processing of the gel-like sheet A, the hot solvent temperature is preferably above the crystalline melting point Tma dispersed within a temperature range of Tcda~ + 10 ° C. 在处理凝胶状片B的情况下，优选上述结晶分散温度Tcdb〜上述熔点Tmb+10°C的范围内。 In the case of gel-like sheet B is treated, preferably the crystal dispersion temperature of the above-mentioned range of the melting point Tmb of Tcdb~ + 10 ° C.
 以下，对交替层叠聚乙烯多微孔膜A及B的工序（6)进行说明。  In the following, the step (6) are alternately laminated polyethylene microporous membranes A and B will be described. 层叠方法不特别限定，但优选热层叠法。 The method of lamination is not particularly limited, but is preferably a thermal lamination method. 作为热层叠法，可以举出热封法、脉冲加热密封法、超声波层叠法等， 优选热封法，作为热封法，优选使用热辊。 As a heat lamination method include heat sealing, impulse heat sealing method, an ultrasonic laminating method, etc., preferably heat sealing, heat sealing, preferably using a heat roll. 在热辊法中，向一对加热辊之间、或加热辊和支撑台之间通过叠置的聚乙烯微多孔膜A及B，并进行热封。 In the heat roll method, to between a pair of heating rolls, or the heating roller and the support table by stacking a polyethylene microporous membrane A and B, and heat-sealed. 热封时的温度及压力只要在聚乙烯微多孔膜充分粘接，且得到的多层微多孔膜的特性不降低的情况下，不特别限定。 A case where characteristics of the multilayer microporous film at heat sealing temperature and pressure in the polyethylene microporous membrane as long as sufficient adhesion, and the resulting decrease is not, is not particularly limited. 热封温度例如为90〜135°C，优选90〜115°C。 Heat-sealing temperature is, for example 90~135 ° C, preferably 90~115 ° C. 热封压力优选0. 01〜50MPa。 Heat-sealing pressure is preferably 0. 01~50MPa. 通过调节聚乙烯多微孔膜A及B的各厚度，能够调节多孔层A及B的比例。 By adjusting the thickness of the polyethylene microporous film of each of A and B, it is possible to adjust the ratio of the porous layers A and B. 工序（6)后的再拉伸工序、热处理工序、热溶剂处理工序、交联处理工序、亲水化处理工序、表面被覆处理工序均与第一方法相同也可。 Re-stretching step after the  Step (6), a heat treatment step, a hot solvent treatment step, crosslinking step, the hydrophilizing treatment step, a surface coating treatment step are the same as the first method may be used. 本发明的聚乙烯多层多微孔膜具有多孔层A及B。  The multilayer microporous polyethylene film of the present invention having a porous layer A and B. 通过具有含有高密度聚乙烯A 的多孔层A，得到出色的关闭特性。 By having a porous layer A comprising high-density polyethylene A to obtain excellent shutdown characteristics. 通过具有含有高密度聚乙烯B的多孔层B，得到出色的高透过性、机械强度及耐氧化性。 Through the porous layer B comprising high-density polyethylene B having obtain outstanding high permeability, mechanical strength and oxidation resistance. 多层多微孔膜的层数不特别限定。  The multilayer microporous film layers is not particularly limited. 若为三层以上，则提高抑制多层多微孔膜的卷边的效果，因此优选。 If three or more layers, the effect of improving the curl suppressing multilayer microporous film, which is preferable. 多孔层A及B的组合也不特别限定。 A combination of porous layer, and B is not particularly limited. 例如，作为多孔层的组合，可以举出A/B、A/B/A、B/A/B等。 For example, as a combination of the porous layer may include A / B, A / B / A, B / A / B and so on. 在用作电池用隔板的情况下，若将两表层做成多孔层A，将内层做成多孔层（例如，A/B/A等），则尤其提高关闭特性、高透过性及机械强度的协调。 In the case of use as a battery separator, if the two porous surface layer is made A, the inner layer is made porous (e.g., A / B / A, etc. ), in particular to improve the shutdown characteristics, and high permeability coordination of mechanical strength. 多孔层A及B的厚度的比例也不特别限定，可以根据对多层多微孔膜要求的物性而适当设定。  A ratio of the thickness of the porous layer, and B is not particularly limited, and depending on the physical properties of the multilayer microporous film is appropriately set requirements. 在用作电池用隔板的情况下，膜剖面中的相对于多孔层A的多孔层B的面积比优选0.1〜1.2。 In the case of use as a battery separator, the film with respect to the cross section area of ​​the porous layer B porous layer A is preferably 0.1~1.2. 若该比小于0.1，则透过性及机械强度降低。 If the ratio is less than 0.1, the mechanical strength and reduce permeability. 另一方面，若大于1.2，则关闭特性低。 On the other hand, if greater than 1.2, the low off characteristics. 若如上所述地使树脂溶液A及B的树脂浓度存在差异，则得到平均细孔径在膜厚方向上变化的结构（倾斜结构：包括具有比较大的平均细孔径的粗大结构层、和具有比较小的平均细孔径的致密结构层的结构）的多层多微孔膜。  As described above, if the resin concentration of the resin solution A and B are different, the average pore size changes in the thickness direction of the structure (inclined structure: comprising a coarse structure layer having a relatively large average pore size, and a fine structure layer having a structure of relatively small average pore size) of the multilayer microporous film. 在将具有倾斜结构的多层多微孔膜用作电池用隔板的情况下，粗大结构层追随电极的膨胀及伸缩，并且保持透过性，致密结构层防止电极之间的短路。 In the case where the multilayer film is used as a battery having a microporous structure with an inclined separator, coarse structure layer following the expansion and the retractable electrodes, and holding to prevent short circuit between electrodes permeable, fine structure layer. 因此，在加压的情况下，透气度变化也小。 Thus, in the case of a pressurized air permeability change is small. 另外，通过具有平均细孔径大的粗大结构层，进一步提高周期特性或电解液注入性。 Further, by having a large average pore size coarse structure layer, or to further improve the cycle characteristics of the electrolyte injection. 具有倾斜结构的多层多微孔膜的贯通孔的形状不特别限定。  The multilayer microporous film shape through hole has an inclined structure is not particularly limited. 在双层多微孔膜（层结构：A/B)的情况下，例如，可以举出单面具有大的开口部，且孔径向相反面逐渐变小的杯型贯通孔。 A microporous membrane bilayer: case (a layer structure A / B), for example, may include one surface having an opening portion larger, and a pore size progressively smaller cup-shaped through-hole in the opposite side. 在三层多微孔膜的情况下，例如，可以举出孔径从两表面向膜的芯部逐渐变小的杯型贯通孔。 In the three-layer microporous membrane, for example, may include an aperture tapered cup to the through-hole from both surfaces of the core film. 本发明的优选的实施方式的聚乙烯多层多微孔膜具有如下的物性。  The multilayer microporous polyethylene film of the preferred embodiment of the present invention having the following physical properties. 在空孔率小于25%的情况下，多层多微孔膜不具有良好的透气度。  In the case where the porosity is less than 25%, the multilayer microporous film does not have good air permeability. 另一方面，若大于80%，则作为电池用隔板使用的情况下的强度不充分，电极短路的危险变大。 On the other hand, if it exceeds 80%, the strength in the case of using the battery separator is insufficient, the risk of short-circuiting the electrodes becomes large. 7[丁^患。 7 [D ^ suffering. 若拉伸断裂强度在纵向（MD)及横向（TD)的任一个方向上均为70，OOOkPa以上， 则在用作电池用隔板时，不会发生膜破裂。  If the tensile breaking strength is 70 in the direction (MD) and transverse direction (TD) in either direction, OOOkPa or more, when used as a battery separator, film breakage does not occur. 若拉伸断裂伸度在纵向（MD)及横向（TD)的任一个方向上均为100%以上，则在用作电池用隔板时不会发生膜破裂。  When the tensile breaking elongation of 100% or more in both longitudinal direction (MD) and transverse direction (TD) in either direction, as is the cell membrane rupture does not occur when using the separator. 若关闭温度大于140°C，则在将多层多微孔膜用作锂电池用隔板的情况下，过热时的遮断响应性降低。  When the shutdown temperature greater than 140 ° C, then in the case of a multilayer microporous film is used as a separator for a lithium battery, blocking resistance is lowered in response to overheating. 消融温度优选160〜190°C。  ablation temperature is preferably 160~190 ° C.
 若关闭速度（使多层多微孔膜样品与调温至135°C的热板接触10秒钟后的透气度（格利值））小于2，000秒/100(^72(^111，则在将多层多微孔膜用作锂电池用隔板的情况下，过热时的遮断响应性降低。  (air permeability (Gurley value) of the multilayer microporous film sample to the hot plate and the temperature control to 135 ° C for 10 seconds after the contact) when the closing speed is less than 2,000 sec / 100 (72 ^ ( ^ 111, then in the case of a multilayer microporous film is used as a separator for a lithium battery, reducing the blocking response when overheated. 若对将多层多微孔膜用作隔板的锂离子电池充电至4. 2V，在60°C下保存2天后的电压降低大于0. 3V，则耐氧化性低，电池的保存特性低。  When a microporous membrane to be used as a separator multilayer lithium ion battery was charged to 4. 2V, the voltage stored 2 days at 60 ° C for reduction is greater than 0. 3V, the oxidation resistance is low, the battery low storage characteristics. 由上述聚乙烯多层多微孔膜构成的电池用隔板可以根据电池的种类适当选择，但优选具有3〜200 μ m的膜厚，更优选具有5〜50 μ m的膜厚。  The polyethylene battery separator of a multilayer microporous film may be suitably selected according to the type of the battery, but preferably has a thickness of 3~200 μ m, and more preferably has a thickness of 5~50 μ m .
 本发明的聚乙烯多层多微孔膜可以优选用作锂二次电池、锂聚合物二次电池、 镍-氢电池、镍-镉电池、镍-锌电池、银-锌电池等二次电池的隔板，但尤其优选用作锂二次电池的隔板。  The multilayer microporous polyethylene film of the present invention can be preferably used as a lithium secondary battery, lithium polymer secondary batteries, nickel - hydrogen batteries, nickel - cadmium battery, a nickel - zinc battery, a silver - zinc batteries, etc. the secondary battery separator, it is particularly preferably used as a separator for lithium secondary batteries. 以下，举锂二次电池为例子进行说明。 Or less, for a lithium secondary battery will be described as an example. 在锂二次电池中，正极和负极经由隔板层叠，隔板含有电解液（电解质）。  In the lithium secondary battery, the positive electrode and the negative electrode laminated via a separator, the separator containing an electrolytic solution (electrolyte). 电极的结构不特别限定，可以为公知的结构。 The electrode structure is not particularly limited, and may be a well-known structure. 例如，可以形成为以使圆盘状正极及负极对置的方式配设的电极结构（硬币型）、平板状正极和负极交替层叠的电极结构（层叠型）、层叠的带状正极及负极卷绕的电极结构（卷绕型）等。 For example, may be formed so that the electrode structure (coin type) disc-shaped positive and negative electrodes disposed opposite manner, the plate-shaped positive and negative electrodes are alternately stacked electrode structure (laminated type), the strip-shaped positive electrode and the negative electrode laminated roll electrode structure wound (wound type). 正极通常具有（a)集电体、和（b)形成在其表面，且含有能够吸留放出锂离子的正极活性物质的层。  The positive electrode generally has (a) a current collector, and (b) is formed on its surface, capable of absorbing and containing a positive electrode active material layer of the storage and release of lithium ions. 作为正极活性物质，可以举出过渡金属氧化物、锂和过渡金属的复合氧化物（锂复合氧化物）、过渡金属硫化物等无机化合物等，作为过渡金属，可以举出V、Mn、Fe、 Co、Ni等。 As the positive electrode active material may include transition metal oxides, and lithium-transition metal composite oxide (lithium composite oxides), transition metal sulfides, inorganic compounds such as transition metals may include V, Mn, Fe, Co, Ni and so on. 作为锂复合氧化物的优选的例子，可以举出镍酸锂、钴酸锂、锰酸锂、以α -NaFeO2 型结构为母体的层状锂复合氧化物等。 Preferable examples of the lithium composite oxide include lithium nickelate, lithium cobaltate, lithium manganate, to the parent α -NaFeO2 structure layered lithium composite oxide. 负极具有（a)集电体、和（b)形成在其表面，且含有负极活性物质的层。 A negative electrode having (a) a current collector, and (b) is formed on its surface, and containing a negative electrode active material layer. 作为负极活性物质，可以举出天然石墨、人造石墨、焦炭类、炭黑等碳质材料。 As the negative electrode active material include natural graphite, artificial graphite, cokes, carbon black and other carbonaceous materials. 电解液可以通过将锂盐溶解于有机溶剂中而得到。  The electrolyte may be obtained by dissolving a lithium salt in an organic solvent. 作为锂盐，可以举出LiC104、 LiPF6、LiAsF6、LiSbF6、LiBF4、LiCF3S03、LiN(CF3S02)2、LiC(CF3S02)3、Li2B1QCl1Q、LiN(C2F5S02)2、 LiPF4 (CF3) 2、LiPF3 (C2F5) 3、低级脂肪族羧酸锂盐、LiAlCl4等。 Examples of the lithium salt include LiC104, LiPF6, LiAsF6, LiSbF6, LiBF4, LiCF3S03, LiN (CF3S02) 2, LiC (CF3S02) 3, Li2B1QCl1Q, LiN (C2F5S02) 2, LiPF4 (CF3) 2, LiPF3 (C2F5) 3 , lower aliphatic carboxylic acid lithium salts, LiAlCl 4 and the like. 这些可以单独使用，也可以作为两种以上的混合物使用。 These may be used alone or may be used as a mixture of two or more. 作为有机溶剂，可以举出碳酸亚乙酯、碳酸亚丙酯、碳酸乙基甲酯、Y-丁内酯等高沸点及高介电常数的有机溶剂、或四氢呋喃、2-甲基四氢呋喃、二甲氧基乙烷、二噁茂烷、碳酸二甲酯、碳酸二乙酯等低沸点及低粘度的有机溶剂。 Examples of the organic solvent include ethylene carbonate, propylene carbonate, ethylmethyl carbonate, Y- butyrolactone high-boiling organic solvents and a high dielectric constant, or tetrahydrofuran, 2-methyl tetrahydrofuran, methoxyethane, dioxane dioxolane, dimethyl carbonate, diethyl carbonate, low boiling organic solvent and low viscosity. 这些可以单独使用，也可以用作两种以上的混合物。 These may be used alone, it may be used as a mixture of two or more. 尤其，高介电常数的有机溶剂的粘度高，且低粘度的有机溶剂的介电常数低，因此，优选使用两者的混合物。 In particular, high-viscosity organic solvent is a high dielectric constant, a low dielectric constant and low viscosity organic solvent is, therefore, preferred to use a mixture of both. 在组装电池时，使电解液浸渍隔板。  In assembling a battery, the electrolyte separator is impregnated. 由此，能够向隔板（聚乙烯多层多微孔膜）赋予离子透过性。 Accordingly, the ion permeability can be imparted to the separator (microporous polyethylene multilayer film). 通常，浸渍处理通过在常温下将多层多微孔膜浸渍于电解液中而进行。 Typically, immersing the multilayer microporous film was immersed in the electrolyte at room temperature is carried out by. 在组装圆筒型电池的情况下，例如，依次层叠正极片、由多层多微孔膜构成的隔板、及负极片， 从一端卷取所得到的层叠体，形成卷绕型电极元件。 In the case of a cylindrical battery is assembled, e.g., sequentially laminating the positive electrode sheet, a separator and a negative electrode sheet composed of a multilayer microporous film, wound from one end of the laminated body thus obtained, forming a wound electrode member. 通过将所得到的电极元件插入电池罐中，将其浸渍于上述电解液中，进而经由垫圈铆接具备安全阀的同时作为正极端子的电池盖，可以制作电池。 By electrode element was inserted in a battery can, which is immersed in the electrolytic solution, and further provided with a safety valve simultaneously caulked via a gasket as a positive electrode terminal of the battery cover, the battery can be produced. 通过以下的实施例，更详细地说明本发明，但本发明不限于这些例子。  The present invention is illustrated by the following examples in more detail, but the present invention is not limited to these examples. 向由重均分子量（Mw)为2. OXlO6的超高分子量聚乙烯（UHMWPE) 30质量％、及Mw 为3. 5 X IO5且末端乙烯基浓度为0. 9个/10，000C的高密度聚乙烯A(HDPE-A) 70质量％构成的聚乙烯（PE)组合物AlOO质量份中，干混合作为抗氧化剂的四[亚甲基-3-(3，5-二特丁基-4-羟基苯基）-丙酸酯]甲烷0.2质量份。  the ultrahigh molecular weight polyethylene having a weight average molecular weight (Mw) of the 2. OXlO6% (UHMWPE) 30 by mass, and Mw of 3. 5 X IO5 and a terminal vinyl group concentration 0.9 / 10,000C high density polyethylene a (HDPE-a) 70% by mass of polyethylene (PE) composition mass constituted AlOO, dry blended as an antioxidant tetrakis [methylene-3- (3,5-di-tert -4-hydroxyphenyl) - propionate] methane, 0.2 parts by mass. 对UHMWPE及HDPE-A构成的聚乙烯（PE) 组合物A测定的熔点为135°C，结晶分散温度为100°C，Mw为8. 4X105, Mw/Mn为Μ. 0。 Polyethylene UHMWPE and HDPE-A configuration of the melting point measurement (PE) composition A was 135 ° C, crystal dispersion temperature of 100 ° C, Mw of 8. 4X105, Mw / Mn of Μ. 0. UHMWPE, HDPE及PE组合物的Mw及Mw/Mn通过在以下的条件下，利用凝胶渗透色谱（GPC)法求得（下同）。  UHMWPE, Mw and Mw HDPE and the PE composition / Mn under the following conditions by using gel permeation chromatography (GPC) method is obtained (below). ·柱：昭和电工株式会社制Shodex UT806M  Column: Shodex UT806M Showa Denko K.K. •校正曲线：由使用单分散聚苯乙烯标准试料得到的校正曲线，使用规定的换算常数来制作。  • Calibration curve: a calibration curve made using a monodisperse polystyrene standard sample obtained, using a predetermined conversion constant to produce. 向强混炼类型的双螺杆挤出机（内径58mm、L/D = 42)中投入得到的混合物30质量份，从双螺杆挤出机的侧面进料口供给液体石蜡[35cst(4(TC )]70质量份，在230°C及250rpm的条件下熔融混炼，配制树脂溶液A。  To a strongly kneading type twin-screw extruder (inner diameter 58mm, L / D = 42) into 30 parts by mass of the mixture obtained in the twin screw extruder from a side feed port for supplying liquid paraffin [35 cSt ( 4 (TC)] 70 parts by mass, melt-kneaded at 230 ° C and 250rpm conditions to prepare a resin solution A. 向由UHMWPE20质量％、及Mw为3. OX 105，Mw/Mn为8. 6，末端乙烯基浓度为0. 1个/10，000C的高密度聚乙烯B (HDPE-B) 80质量％构成的PE组合物B (熔点：135°C、结晶分散温度：100°C、Mw ：6. 4X IO5, Mw/Mn :15. 2)中，如上所述地干混合抗氧化剂，配制混合物。  Polyethylene B (HDPE-B) 80% by mass to the UHMWPE20, and Mw of 3. OX 105, Mw / Mn of 8.6, the terminal vinyl group concentration of 0.1 / 10,000C high density PE mass% of composition B (melting point: 135 ° C, crystal dispersion temperature: 100 ° C, Mw:. 6 4X IO5, Mw / Mn:. 15 2), the dry blending an antioxidant as described above to prepare mixture. 除了使用得到的混合物，树脂浓度为20质量％以外，与上述相同地，配制聚乙烯树脂溶液B。 In addition to the resulting mixture, other than a resin concentration of 20% by mass, similarly to the above to prepare a polyethylene resin solution B. 将得到的聚乙烯树脂溶液A及B分别从双螺杆挤出机供给于双层用T模头，将其挤出（层厚比：A/B = 2/l)。  The resulting polyethylene resin solutions A and B each supplied from a twin screw extruder with a double-layer T-die extruding (thickness ratio: A / B = 2 / l). 将挤出的成形体用温度调节为0°C的冷却辊拉出的同时冷却，形成凝胶状双层片。 The extruded molded body temperature is adjusted at 0 ° C while cooling the cooling roll is pulled out to form a gel-like bilayer tablet. 利用拉幅拉伸机对得到的凝胶状双层片进行同时双轴拉伸，使纵向（MD)及横向（TD)均成为5倍。 Gel using a tenter stretching machine for bi-layer tablet obtained simultaneously biaxially stretched, so that the longitudinal direction (MD) and transverse direction (TD) have become 5 times. 将拉伸凝胶状双层片固定于框板[尺寸：20CmX20Cm、铝制]，将其浸渍于温度调节为25°C的二氯甲烷的清洗槽中，以IOOrpm摆动3分钟的同时清洗，除去液体石蜡。 The stretched gel-like sheet is fixed to the frame plate bilayer [Size: 20CmX20Cm, aluminum], immersed in the cleaning bath temperature was adjusted to 25 ° C and methylene chloride, washed three simultaneously swing to IOOrpm minutes, remove the liquid paraffin. 将清洗的膜在室温下风干，将其固定于拉幅机，在127°C下热固定处理10分钟，由此制作聚乙烯双层多微孔膜。 The washed film was air dried at room temperature, fixed to a tenter, heat-treated at 127 ° C 10 minutes, to produce a polyethylene microporous membrane bilayer. 与实施例1相同地，向由UHMWPE20质量％、及HDPE-A80质量％构成的PE组合物A(熔点:135°C、结晶分散温度：100°C、Mw :6. 8X105、Mw/Mn :21. 5)中，干混合抗氧化剂，配制混合物。  Example in the same manner, the PE composition A (melting point of UHMWPE20 mass%, and HDPE-A80 mass% of a 1: 135 ° C, crystal dispersion temperature: 100 ° C, Mw:. 6 8X105, Mw / Mn:. 21 5), the dry mixture of antioxidants, prepare a mixture. 除了使用得到的混合物，树脂浓度为20质量％以外，与实施例1相同地，配制聚乙烯树脂溶液A。 In addition to the resulting mixture, other than a resin concentration of 20 mass%, the same as in Example 1 to prepare a polyethylene resin solution A. 与实施例1相同地，向由UHMWPE30质量％、及HDPE-B70质量％构成的PE组合物B (熔点:135°C、结晶分散温度：IOO0C、Mw :8. 5 X 105、Mw/Mn ： 17. 2)中，干混合抗氧化剂，配制混合物。  Example 1 in the same manner, the PE composition B (melting point of UHMWPE30 mass%, and HDPE-B70% by mass composed of: 135 ° C, crystal dispersion temperature: IOO0C, Mw:. 8 5 X 105, Mw / Mn: 17. 2), the dry mixture of antioxidants, prepare a mixture. 除了使用得到的混合物，树脂浓度为30质量％以外，与实施例1相同地，配制聚乙烯树脂溶液B。 In addition to the resulting mixture, other than a resin concentration of 30% by mass, in the same manner as in Example 1 to prepare a polyethylene resin solution B. 除了将挤出成形体的层厚比设为溶液A/溶液B = 1/1以外，与实施例1相同地， 制作凝胶状双层片。  except that the ratio of thickness of the extruded article to Solution A / Solution B = 1/1 outside, in the same manner as in Example 1 to prepare a gel-like bilayer tablet. 将得到的凝胶状双层片与实施例1相同地，进行同时双轴拉伸，进行清洗、风干。 The gel-like bilayer tablet obtained in the same manner as in Example 1, was simultaneously biaxially stretched, washed and air dried. 将得到的膜固定于拉幅机上，在下进行再拉伸，使其在TD方向上成为1.2 倍，在下进行热固定处理10分钟，由此制作聚乙烯双层多微孔膜。 The resulting film was fixed on a tenter, re-stretched in the next, making it 1.2 times in the TD direction, the lower heat-fixed for 10 minutes, to produce a polyethylene microporous membrane bilayer. 除了作为聚乙烯系树脂A仅使用HDPE-A，且树脂浓度为25质量％以外，与实施例1相同地，配制聚乙烯树脂溶液A。  In addition to the use of HDPE-A resin A only as polyethylene, and the resin concentration of 25% by mass except that in Example 1 to prepare a polyethylene resin solution A. 除了作为聚乙烯系树脂B仅使用HDPE-B，且树脂溶液为40质量％以外，与实施例1相同地，配制聚乙烯树脂溶液B。 HDPE-B, except that only the polyethylene resin B, and the resin solution was 40 mass% except in the same manner as in Example 1 to prepare a polyethylene resin solution B. 除了将挤出成形体的层厚比设为溶液A/溶液B = 1/1以外，与实施例1相同地，制作凝胶状双层片。 Except that the ratio of thickness of the extruded article to Solution A / Solution B = 1/1 outside, in the same manner as in Example, a prepared gel bilayer tablet. 除了使用得到的凝胶状双层片，将同时双轴拉伸的温度设为116°C，清洗、干燥后在128. 5°C下进行再拉伸，使其在TD方向上成为1. 2倍，且将热固定处理温度设为128. 5°C之外，与实施例1相同地，制作聚乙烯双层多微孔膜。 In addition to the double sheet using the obtained gel, the simultaneous biaxial stretching temperature is set to 116 ° C, washed, re-stretched at 128. 5 ° C after drying, making it 1 in the TD. 2 times, and the heat-treatment temperature was set to 128. 5 ° C than, the same as in Example 1, the production of the polyethylene microporous membrane bilayer. 与实施例1相同地，向由UHMWPE35质量％、及HDPE-A65质量％构成的PE组合物A (熔点:135°C、结晶分散温度：100°C、Mw :9. 3 X IO5、Mw/Mn :24. 5)中，干混合抗氧化剂，配制混合物。  Example in the same manner, the PE composition A (melting point of UHMWPE35 mass%, and HDPE-A65 mass% of a 1: 135 ° C, crystal dispersion temperature: 100 ° C, Mw:. 9 3 X IO5 , Mw / Mn:. 24 5), the dry mixture of antioxidants, prepare a mixture. 除了使用得到的混合物，树脂浓度为40质量％以外，与实施例1相同地，配制聚乙烯树脂溶液A。 In addition to the resulting mixture, other than a resin concentration of 40% by mass, the same as in Example 1 to prepare a polyethylene resin solution A. 与实施例1相同地，向由UHMWPE18质量％、及HDPE-B82质量％构成的PE组合物B (熔点:135°C、结晶分散温度：100°C、Mw :5. 9X105、Mw/Mn :14. 7)中，干混合抗氧化剂，配制混合物。  Example in the same manner, the PE composition B (melting point of UHMWPE18 mass%, and HDPE-B82 mass% of a 1: 135 ° C, crystal dispersion temperature: 100 ° C, Mw:. 5 9X105, Mw / Mn:. 14 7) dry blending the antioxidant to prepare a mixture. 除了使用得到的混合物，树脂浓度为15质量％以外，与实施例1相同地，配制聚乙烯树脂溶液B。 In addition to the resulting mixture, other than a resin concentration of 15% by mass, in the same manner as in Example 1 to prepare a polyethylene resin solution B. ⑶成膜 将得到的聚乙烯树脂溶液A及B分别从双螺杆挤出机供给于三层用T模头，以成为按溶液A/溶液B/溶液A的顺序层叠的成形体的方式将其挤出（层厚比：A/B/A = 2/1/2)。  ⑶ deposition  The resulting polyethylene resin solutions A and B are supplied to a twin-screw extruder with a three-layer T-die, so as to be press solution A / solution B are sequentially stacked / A solution of molded extruded way (thickness ratio: a / B / a = 2/1/2). 将挤出的成形体用温度调节为0°C的冷却辊拉出的同时冷却，形成凝胶状三层片。 The extruded molded body temperature is adjusted at 0 ° C while cooling the cooling roll is pulled out, form a three-layer gel-like sheet. 与实施例1相同地，对得到的凝胶状三层片进行同时双轴拉伸，进行清洗、风干。 A simultaneous biaxial stretching in the same manner, a three-layer sheet of gel obtained in Example, washed and air dried. 将得到的膜固定于拉幅机上，在128. 5°C下进行再拉伸，使其在TD方向上成为1. 4倍，在128. 5°C下进行10分钟的热固定处理，由此制作聚乙烯三层多微孔膜。 The resulting film was fixed on a tenter, re-stretched at 128. 5 ° C, making it 1.4 times in the TD direction, heat set for 10 minutes at 128. 5 ° C, the this three-layer microporous membrane made of polyethylene. 与实施例1相同地，向由UHMWPE5质量％、及HDPE-A95质量％构成的PE组合物A(熔点:135°C、结晶分散温度：100°C、Mw :4. 6X105、Mw/Mn :15. 9)中，干混合抗氧化剂，配制混合物。  Example in the same manner, the PE composition A (melting point of UHMWPE5 mass%, and HDPE-A95 mass% of a 1: 135 ° C, crystal dispersion temperature: 100 ° C, Mw:. 4 6X105, Mw / Mn:. 15 9), dry blending an antioxidant to prepare a mixture. 除了使用得到的混合物，树脂浓度为40质量％以外，与实施例1相同地，配制聚乙烯树脂溶液A。 In addition to the resulting mixture, other than a resin concentration of 40% by mass, the same as in Example 1 to prepare a polyethylene resin solution A. 将得到的聚乙烯树脂溶液A从设置于双螺杆挤出机的前端的T模头挤出， 用温度调节为0°C的冷却辊拉出的同时冷却，形成凝胶状片A。 The polyethylene resin solution A obtained from the twin-screw extruder is provided in the front end of the T-die extrusion, adjusting the temperature of 0 ° C with a chill roll while cooling the drawn, gel-like sheet form A. 与实施例1相同地，对得到的凝胶状片A进行同时双轴拉伸，进行清洗、风干，由此制作聚乙烯多微孔膜A。 The same manner as in Example 1, a gel-like sheet A was subjected to simultaneous biaxial stretching, washed, air-dried, thereby producing a polyethylene microporous membrane A. 与实施例1相同地，向由UHMWPE5质量％、及HDPE-B95质量％构成的PE组合物B (熔点:135°C、结晶分散温度：100°C、Mw ：3. 8 X IO5, Mw/Mn :11.0)中，干混合抗氧化剂，配制混合物。  Example in the same manner, the PE composition B (melting point of UHMWPE5 mass%, and HDPE-B95 mass% of a 1: 135 ° C, crystal dispersion temperature: 100 ° C, Mw:. 3 8 X IO5 , Mw / Mn: 11.0), the dry mixture of antioxidants, prepare a mixture. 使用得到的混合物，与实施例1相同地，配制树脂浓度为20质量％的聚乙烯树脂溶液B。 A mixture obtained in Example 1 to prepare a resin concentration of 20% by mass of polyethylene resin solution B. 除了使用得到的聚乙烯树脂溶液B以外，与上述多微孔膜A相同地，制作聚乙烯多微孔膜B。 In addition to the use of polyethylene resin solution B obtained above with a microporous membrane A in the same manner, making the polyethylene microporous membrane B. 将得到的聚乙烯多微孔膜A及B层叠，使其通过加热至130°C的温度的一对辊间， 以0. 05MPa的压力接合。  A polyethylene microporous membrane and the resulting laminate B, between a pair of rollers heated to a temperature of 130 ° C, the engagement pressure of 0. 05MPa. 通过将得到的层叠膜在130°C下热固定10分钟，制作聚乙烯双层多微孔膜（层厚比：膜A/膜B = 1/1)。 The laminated film obtained by heat-fixed for 10 minutes at 130 ° C, making a microporous membrane bilayer polyethylene (thickness ratio: membrane A / membrane B = 1/1). 除了使用与实施例2相同的PE组合物A，树脂浓度为30质量％以夕卜，与实施例1 相同地，配制聚乙烯树脂溶液A。  Example except for using the same PE composition A, resin concentration of 30% by mass to 2 Bu Xi, the same as in Example 1 to prepare a polyethylene resin solution A. 将得到的聚乙烯树脂溶液A从设置于双螺杆挤出机的前端的T模头挤出，用温度调节为0°C的冷却辊拉出的同时冷却，形成凝胶状片。 The polyethylene resin solution A obtained from a T-die provided at the tip of a twin-screw extruder, extrusion, adjusting the temperature of 0 ° C with the chill roll while cooling the drawn, gel-like sheet formed. 与实施例1相同地，对得到的凝胶状片进行同时双轴拉伸，进行清洗、风干。 A simultaneous biaxial stretching in the same manner, of the gel-like sheet obtained in Example, washed and air dried. 将得到的膜固定于拉幅机上， 在125°C下进行10分钟的热固定处理，由此制作聚乙烯多微孔膜。 The resulting film was fixed on a tenter for heat treatment for 10 minutes at 125 ° C, thereby producing a polyethylene microporous membrane. 除了使用与实施例1相同的PE组合物B，树脂浓度为30质量％以夕卜，与实施例1 相同地，配制聚乙烯树脂溶液B。  In addition to using the same as in Example 1 PE composition B, a resin concentration of 30% by mass Bu Xi, in the same manner as in Example 1 to prepare a polyethylene resin solution B. 除了使用得到的聚乙烯树脂溶液B，将热固定处理温度设为以外，与比较例1相同地，制作聚乙烯多微孔膜。 In addition to the polyethylene resin solution B obtained was used, except the heat set temperature is set, the same manner as in Comparative Example 1, the polyethylene microporous membrane produced. 除了使用由UHMWPE40质量％、HDPE-A30质量％及HDPE-B30质量％构成的PE组合物(熔点：135°C、结晶分散温度:100Mw ：9. 9X IO5,Mw/Mn :22. 7)，将树脂溶液设为25 质量％以外，与实施例1相同地，配制聚乙烯树脂溶液。  In addition to the PE composition (melting point of UHMWPE40 mass%, HDPE-A30 mass% and HDPE-B30% by mass composed of: 135 ° C, crystal dispersion temperature: 100Mw:. 9 9X IO5, Mw / Mn: 22. 7), the resin solution is set to 25 mass%, it was the same as in Example 1 to prepare a polyethylene resin solution. 除了使用得到的聚乙烯树脂溶液， 将同时双轴拉伸温度设为116°C，将热固定处理温度设为127°C以外，与比较例1相同地，制作聚乙烯多微孔膜。 In addition to the use of polyethylene resin solution was obtained, the simultaneous biaxial stretching temperature is set at 116 ° C, the heat fixation treatment temperature is set at 127 ° C than, the same manner as in Comparative Example 1, the polyethylene microporous membrane produced. 通过以下的方法，测定实施例1〜5及比较例1〜3中得到的聚乙烯（多层）多微孔膜的物性。  by the following method, measuring the physical properties of polyethylene (multi-layer) microporous membranes of Examples 1 ~ 5 and Comparative Examples 1 ~ 3 obtained in the Examples. 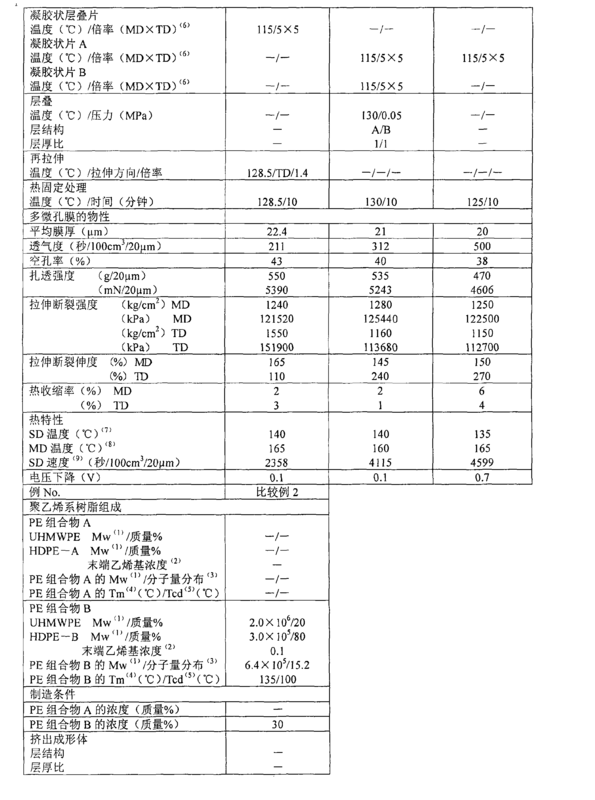 结果示出在表1中。 The results are shown in Table 1. 利用接触厚度计，在（多层)多微孔膜的30cm的宽度上以5mm的纵向间隔测定膜厚，对膜厚的测定值取平均。  using a contact thickness gauge in the width (multi-layer) microporous membrane of 30cm longitudinally spaced 5mm thickness, the measured film thickness values ​​are averaged. 将按照JIS P8117对膜厚T1的（多层）多微孔膜测定的透气度P1,利用式：P2 = (P1 χ 20) /T1换算为膜厚20 μ m时的透气度P2。  The air permeability P1 according to the determination of a microporous membrane of a thickness T1 of JIS P8117 (multilayer), using the formula: P2 = (P1 χ 20) / T1 in terms of film thickness when the air permeability of 20 μ m P2 . 利用质量法测定。  measured by a mass method. 测定在用前端为球面（曲率半径R ：0. 5mm)的直径Imm的针，以2mm/秒的速度扎透膜厚T1的（多层）多微孔膜时的最大负荷。  measured with a spherical tip end (radius of curvature R:. 0 5mm) Imm diameter needle at a rate of 2mm / sec pierce the film thickness T1 at the maximum load (multi-layer) microporous membrane. 最大负荷的测定值L1利用式：L2 = (L1X 20)/ T1换算为膜厚20 μ m时的最大负荷L2,将其作为扎透强度。 Measured value using the formula of the maximum load L1: L2 = (L1X 20) / T1 in terms of the maximum load L2 at a thickness of 20 μ m, as the pierce strength. 使用宽度IOmm的长条状试片，利用ASTM D882进行测定。  A width of the elongated IOmm test piece was measured using ASTM D882. 通过对在105°C下，将（多层）多微孔膜暴露8小时后的纵向（MD)及横向（TD)的收缩率，分别测定各三次，算出平均值来求出。  By direction (MD) and transverse direction (TD) shrinkage after at 105 ° C, the (multi-layer) microporous membrane 8 hours exposure were measured three times each, calculating the average value is obtained. 使用热机械分析装置（精工电子工业株式会社制、TMA/SS6000)，以负荷2g，在试片的纵向上牵引IOmm(TD) X3mm(MD)的试片的同时，以5°C /分钟的速度从室温升温，将熔点附近观测到的拐点的温度作为关闭温度。 While  Using a thermomechanical analyzer (manufactured by Seiko Instruments Inc., TMA / SS6000), a load of 2g, traction IOmm (TD) X3mm (MD) of the test piece in the longitudinal direction of the test piece, in 5 ° C / minute from room temperature, the temperature of the inflection point observed near the melting point as the shutdown temperature. 使用上述热机械分析装置，以负荷2g，在试片的纵向上牵引IOmm(TD) X 3mm(MD) 的试片的同时，以5°C /分钟的速度从室温升温，测定由于熔融而发生膜破裂的温度。 While  Using the above thermomechanical analyzer, a load of 2g, traction IOmm (TD) X 3mm (MD) of the test piece in the longitudinal direction of the test piece at a rate of 5 ° C / min from room temperature, measured since melt temperature and rupture occurs. 测定使（多层）多微孔膜接触温度调节为135°C的热板上10秒钟后的透气度（秒/100cm3/20 μ m)，将其作为关闭速度的指标。  Determination of (multi-layer) microporous membrane contacting temperature is adjusted to 135 ° C air permeability (seconds / 100cm3 / 20 μ m) after 10 seconds on a hot plate, the closing speed as an index. 向由碳酸亚丙酯（PC)：碳酸二乙酯（DEC) = 1 ： 1(质量比）构成的溶剂中添加LiClO4(高氯酸锂）1M，配制电解液。  To a solution of propylene carbonate (PC): diethyl carbonate (DEC) = 1: 1 (mass ratio) added solvent composed of LiClO4 (lithium perchlorate) 1M, formulated in the electrolytic solution. 依次层叠正极片(活性物质：LiCoO2)、隔板[(多层) 多微孔膜样品]及负极片（活性物质：碳质材料），制作由得到的层叠体构成的电极元件。 Sequentially laminating the positive electrode sheet (active material: of LiCoO2), a separator [(multi-layer) microporous membrane sample] and the negative electrode sheet (active material: a carbon material), an electrode element made of a laminated body obtained thereof. 将得到的电子元件浸渍于电解液中，将其夹在2张层叠薄膜之间而封入，制作薄膜状单元。 The electronic component was immersed in the electrolyte, sandwiched between two thin film laminate sealed to produce film-like unit. 将得到的薄膜状单元充电至4. 2V，在60°C的温度下保存2天后，测定电压的下降（V)。 The resulting film-like charging unit to 4. 2V, stored for 2 days at a temperature of 60 ° C, measured voltage drop (V). 电压的下降越小，耐氧化性越出色。 The smaller the voltage drop, the more excellent oxidation resistance. 注：（I)Mw表示重均分子量。  Note: (I) Mw represents a weight average molecular weight. (2)利用红外分光法测定的每10，000个碳原子中的末端乙烯基浓度（个/10，000C)。  per 10,000 carbon atoms, (2) measured by infrared spectroscopy in the terminal vinyl group concentration (number / 10,000C). (3)相对数均分子量的重均分子量之比（Mw/Mn)。  weight (3) a relative number average molecular weight-average molecular weight ratio (Mw / Mn). (4) Tm表示熔点。  (4) Tm represents the melting point. (5) Tcd表示结晶分散温度。  (5) Tcd dispersion represents the crystallization temperature. (6) MD表示纵向，TD表示横向。  (6) MD represents a longitudinal direction, TD represents a transverse direction. (7) SD温度表示关闭温度。  (7) SD temperatures are shutdown temperature. (8) MD温度表示消融温度。  (8) MD represents a temperature of the ablation temperature. (9) SD速度表示关闭速度。  (9) SD speed indicates the closing speed. 从表1可知，实施例1〜5的聚乙烯多层多微孔膜的透过性、机械强度、耐热收缩性、关闭特性、消融特性及耐氧化性的协调出色，尤其关闭速度出色。  apparent from Table 1, embodiments permeability, mechanical strength, heat shrinkable polyethylene multilayer microporous film of Example 1 ~ 5, the shutdown characteristics, excellent oxidation resistance and ablation characteristics of coordination, in particular off excellent speed. 相对于此，比较例1的膜仅由含有HDPE-A的聚乙烯组合物A构成，不具有含有HDPE-B的层。  In contrast, the film of Comparative Example 1 composed only of the polyethylene composition A containing HDPE-A and not containing a layer of HDPE-B. 因此，与实施例1〜5相比，透过性及耐氧化性差。 Thus, compared with Example 1 ~ 5, permeability and oxidation resistance difference. 比较例2的膜仅由含有HDPE-B的聚乙烯组合物B构成，不具有含有HDPE-A的层。 Comparative Example 2 film is composed of only polyethylene composition B containing HDPE-B, and does not have a layer containing HDPE-A. 因此，与实施例1〜5相比，关闭速度差。 Thus, compared with Example 1 ~ 5, the closing speed difference. 比较例3的膜由含有HDPE-A及HDPE-B的聚乙烯组合物构成，但HDPE-A及HDPE-B 被混合，不具有层状结构，因此，与实施例1〜5相比，关闭速度及耐氧化性差。 Film of Comparative Example 3 is composed of a polyethylene composition comprising HDPE-A and HDPE-B, but HDPE-A and HDPE-B are mixed, does not have a layered structure, and therefore, as compared with Examples 1 ~ 5, closed oxidation resistance and the speed difference. 1. 一种聚乙烯多层多微孔膜，其至少包含两层，其特征在于，具有：(a)聚乙烯系树脂多孔层A，其含有利用红外分光法测定的末端乙烯基浓度在每10，000个碳原子中为0. 2个以上的高密度聚乙烯A ；及(b)聚乙烯系树脂多孔层B，其含有利用红外分光法测定的末端乙烯基浓度在每10，000个碳原子中小于0. 2个的高密度聚乙烯B，所述末端乙烯基浓度是将高密度聚乙烯A及B的颗粒分别加热加压，将其成形为约Imm 厚度的样品后，利用傅立叶变换红外分光光度计分别测定910CHT1下的吸收峰的吸光度，利用式：末端乙烯基浓度（个/10，000C) = (1. 14X吸光度）/[聚乙烯的密度（g/cm3)X样品的厚度（mm)]算出的。 A polyethylene multilayer microporous film comprising at least two layers, characterized by comprising: (a) a porous polyethylene resin layer A, which is measured by infrared spectroscopy containing terminal vinyl group concentration per 10,000 or more carbon atoms is 0.2 a high density polyethylene; and (b) a porous polyethylene resin layer B, which comprises the use of infrared spectroscopy measurement terminal vinyl group concentration per 10,000 carbon less than 0.2 of the high-density polyethylene B, the terminal vinyl group concentration is high density polyethylene particles a and B are heated and pressurized and molded about Imm sample thickness after Fourier transform infrared spectrophotometer are measured at the peak absorbance of 910CHT1 by the formula: terminal vinyl group concentration (number / 10,000C) = (1. 14X absorbance) / [density of the polyethylene (g / cm3) X sample thickness (mm)] is calculated. 2. —种聚乙烯多层多微孔膜的制造方法，其特征在于，熔融混炼聚乙烯系树脂A、及成膜用溶剂，配制聚乙烯系树脂溶液A，并且熔融混炼聚乙烯系树脂B、及成膜用溶剂，配制聚乙烯系树脂溶液B，从模头同时挤出所述聚乙烯系树脂溶液A及B，冷却得到的挤出成形体，形成凝胶状层叠片，从所述凝胶状层叠片除去所述成膜用溶剂，其中，所述聚乙烯系树脂A含有利用红外分光法测定的末端乙烯基浓度在每10，000个碳原子中为0. 2个以上的高密度聚乙烯A，所述聚乙烯系树脂B含有利用红外分光法测定的末端乙烯基浓度在每10，000个碳原子中小于0. 2个的高密度聚乙烯B，所述末端乙烯基浓度是将高密度聚乙烯A及B的颗粒分别加热加压，将其成形为约Imm 厚度的样品后，利用傅立叶变换红外分光光度计分别测定910CHT1下的吸收峰的吸光度，利用式：末端乙烯基浓度（ 2. - Method for producing polyethylenes multilayer microporous film, characterized in that the melt-kneading the polyethylene resin A, and the film-forming solvent to prepare a polyethylene resin solution A, and the melt-kneading polyethylene resin B, and the film-forming solvent to prepare a polyethylene resin solution B, while extruding the polyethylene-based resin from the die a and the solution B, cooling the resulting extruded article to form a gel-like laminate sheet, from the gel-like laminate sheet with a solvent to remove the deposition, wherein the polyethylene resin a comprising measured using infrared spectroscopy terminal vinyl group concentration per 10,000 carbon atoms is 0.2 or more high-density polyethylene a, the polyethylene resin B comprising high-density measured using infrared spectroscopy terminal vinyl group concentration of less than 0.2 per 10,000 carbon atoms in the polyethylene B, the terminal vinyl group concentration is high density polyethylene particles a and B are heated and pressurized, which is formed after a sample thickness of about Imm, Fourier transform infrared spectrophotometer measuring the absorbance at the absorption peak 910CHT1 respectively, using the formula: end vinyl concentration ( /10，000C) = (1. 14X吸光度）/[聚乙烯的密度（g/cm3)X样品的厚度（mm)]算出的。 / 10,000C) = (1. 14X absorbance) / [density of the polyethylene (g / cm3) X sample thickness (mm)] is calculated. 3. —种聚乙烯多层多微孔膜的制造方法，其特征在于，熔融混炼聚乙烯系树脂A、及成膜用溶剂，配制聚乙烯系树脂溶液A，并且熔融混炼聚乙烯系树脂B、及成膜用溶剂，配制聚乙烯系树脂溶液B，从模头个别地挤出所述聚乙烯系树脂溶液A及B，冷却得到的挤出成形体A及B，形成凝胶状层叠片A及B，从所述凝胶状片A及B除去所述成膜用溶剂，形成聚乙烯多微孔膜A及B，层叠所述聚乙烯多微孔膜A及B， 其中，所述聚乙烯系树脂A含有利用红外分光法测定的末端乙烯基浓度在每10，000个碳原子中为0.2个以上的高密度聚乙烯A，所述聚乙烯系树脂B含有利用红外分光法测定的末端乙烯基浓度在每10，000个碳原子中小于0. 2个的高密度聚乙烯B，所述末端乙烯基浓度是将高密度聚乙烯A及B的颗粒分别加热加压，将其成形为约Imm 厚度的样品后，利用傅立叶变换红外分光光度 3. - A method for producing a multilayer microporous film of polyethylenes, characterized in that the melt-kneading the polyethylene resin A, and the film-forming solvent to prepare a polyethylene resin solution A, and the melt-kneading polyethylene resin B, and the film-forming solvent to prepare a polyethylene resin solution B, separately extruded from the die of the polyethylene resin solutions a and B, cooling the resulting extruded article a and B, form a gel laminated sheets A and B, the gel-like sheet A from B and removing the film-forming solvent to form a polyethylene microporous membrane A and B, the laminated polyethylene microporous membrane A and B, wherein a polyethylene resin comprising said measured by infrared spectroscopy in the terminal vinyl group concentration per 10,000 carbon atoms is 0.2 or more high-density polyethylene a, B containing the polyethylene resin by infrared spectroscopy Determination of the terminal vinyl group concentration of less than 0.2 per 10,000 carbon atoms in the high-density polyethylene B, the terminal vinyl group concentration is high density polyethylene particles a and B are heated and pressurized, the after a sample shaped to a thickness of about Imm, Fourier transform infrared spectrophotometry 分别测定910CHT1下的吸收峰的吸光度，利用式：末端乙烯基浓度（个/10，000C) = (1. 14X吸光度）/[聚乙烯的密度（g/cm3)X样品的厚度（mm)]算出的。 Determination of the absorption peak absorbance 910CHT1, respectively, using the formula: terminal vinyl group concentration (number / 10,000C) = (1. 14X absorbance) / [density of the polyethylene (g / cm3) X sample thickness (mm)] calculated. 4. 一种电池用隔板，其特征在于，包括聚乙烯多层多微孔膜，该聚乙烯多层多微孔膜至少包含两层，具有：(a)聚乙烯系树脂多孔层A，其含有利用红外分光法测定的末端乙烯基浓度在每10，000个碳原子中为0. 2个以上的高密度聚乙烯A;及（b)聚乙烯系树脂多孔层B，其含有利用红外分光法测定的末端乙烯基浓度在每10，000个碳原子中小于0. 2个的高密度聚乙烯B，所述末端乙烯基浓度是将高密度聚乙烯A及B的颗粒分别加热加压，将其成形为约Imm 厚度的样品后，利用傅立叶变换红外分光光度计分别测定910CHT1下的吸收峰的吸光度，利用式：末端乙烯基浓度（个/10，000C) = (1. 14X吸光度）/[聚乙烯的密度（g/cm3)X样品的厚度（mm)]算出的。 A battery separator comprising a microporous membrane comprising polyethylene multilayer, the multilayer microporous polyethylene membrane comprises at least two layers, having: (a) a porous polyethylene resin layer A, which comprises using measured by infrared spectroscopy terminal vinyl group concentration per 10,000 carbon atoms is less than 0.2 a high density polyethylene; and (b) a porous polyethylene resin layer B, which comprises using an infrared Determination of the terminal vinyl group concentration of less than spectroscopy is 0.2 per 10,000 carbon atoms in the high-density polyethylene B, the terminal vinyl group concentration is high density polyethylene particles a and B are heated and pressed after the sample is formed into a thickness of about Imm, a Fourier transform infrared spectrophotometer using the peak absorbance were measured under 910CHT1, using the formula: terminal vinyl group concentration (number / 10,000C) = (1. 14X absorbance) / [density of the polyethylene (g / cm3) X sample thickness (mm)] is calculated. Free format text: FORMER OWNER: TONEN CHEMICAL CORP. Owner name: TORAY BATTERY SEPARATOR FILM CO., LTD.
Free format text: FORMER NAME: TONEN SEKIYUKAGAKU K.K.